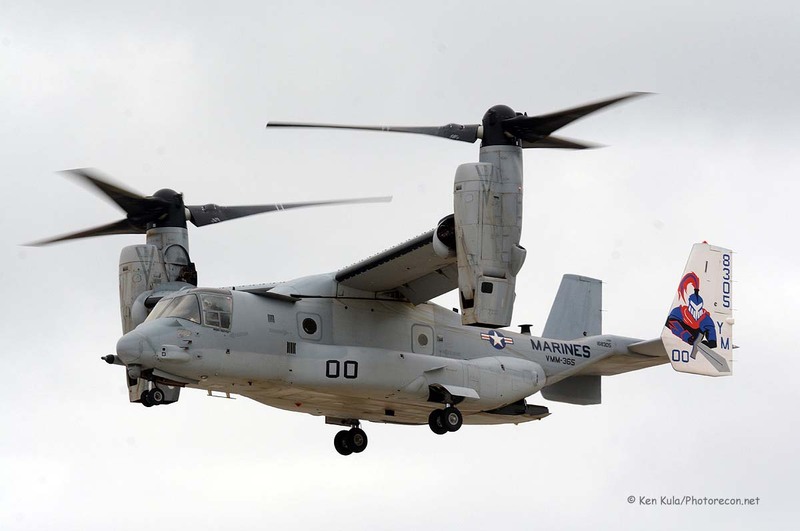 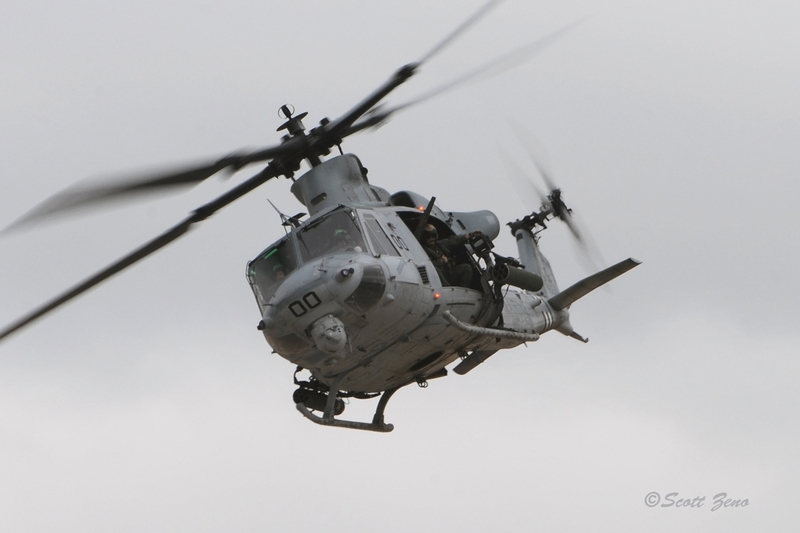 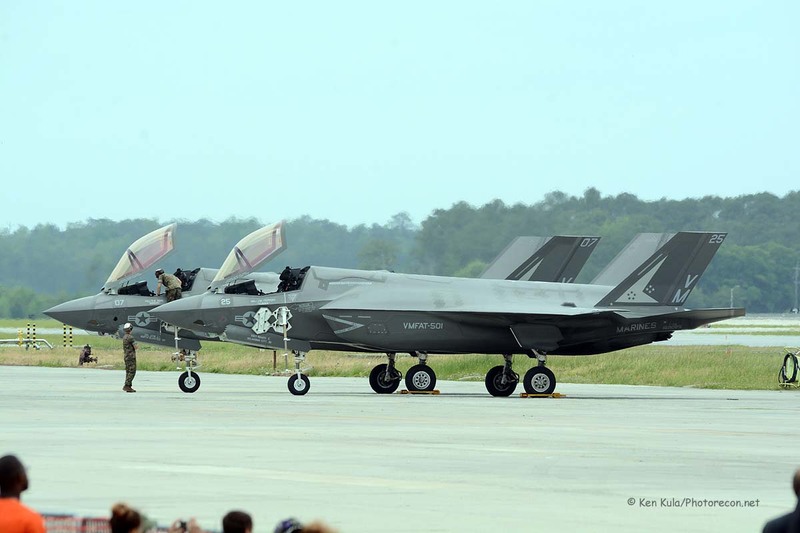 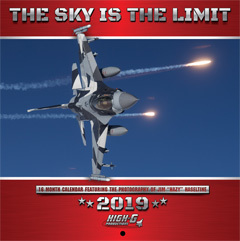 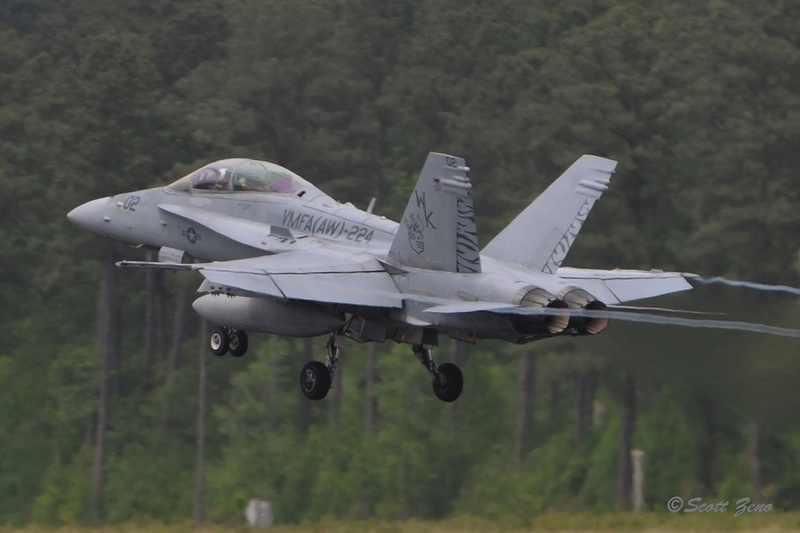 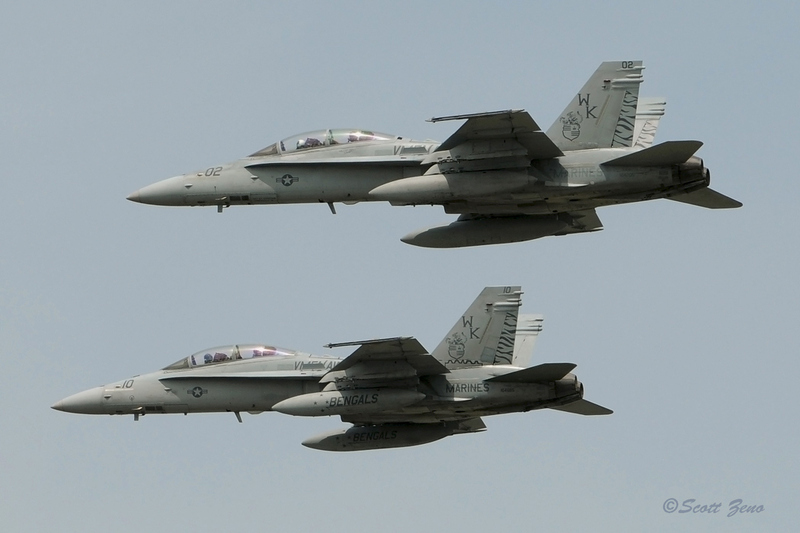 Over the last weekend in April 2016, Marine Corps Air Station Cherry Point, in the town of Havelock North Carolina, offered their 75th Anniversary Air Show. 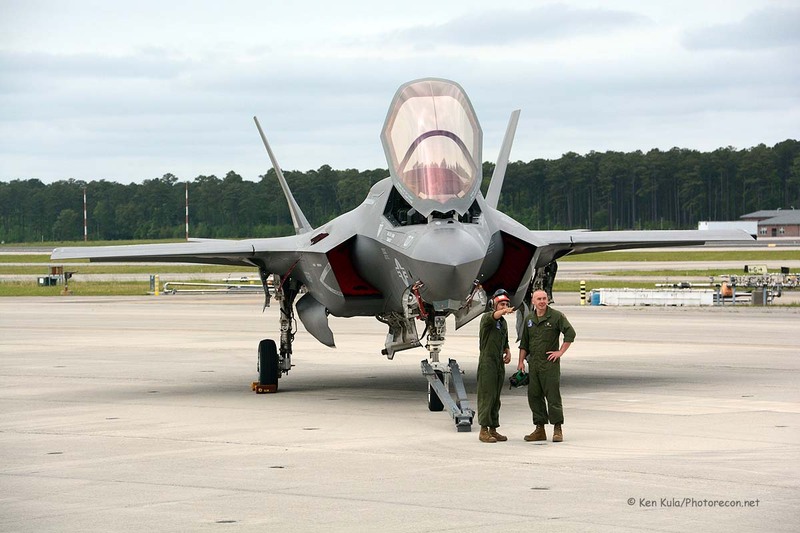 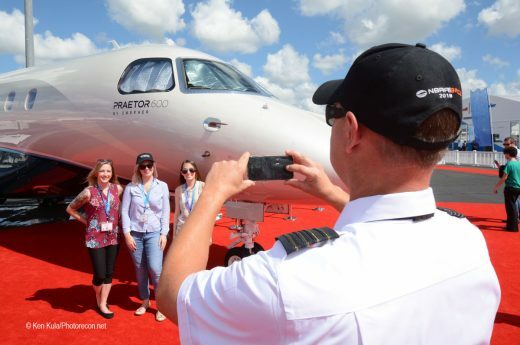 The last three quarters of a century has seen monumental changes in aviation, much more than the earlier 38 years prior to the base’s construction in 1941. 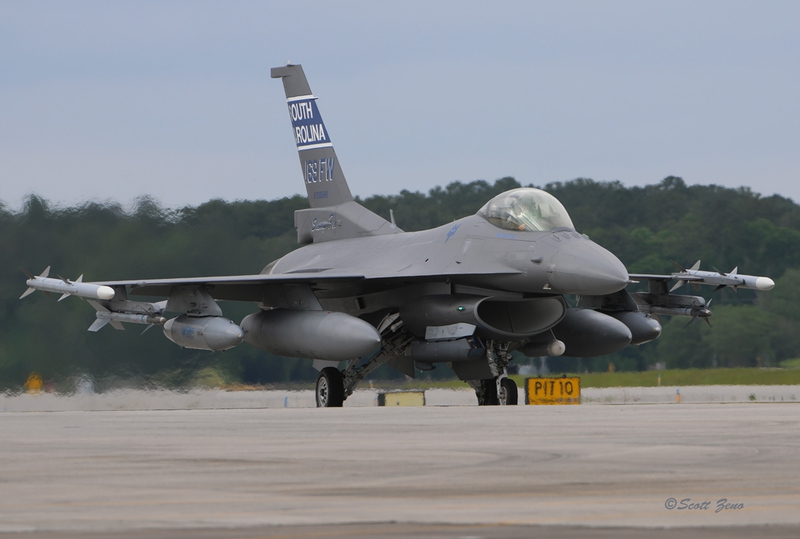 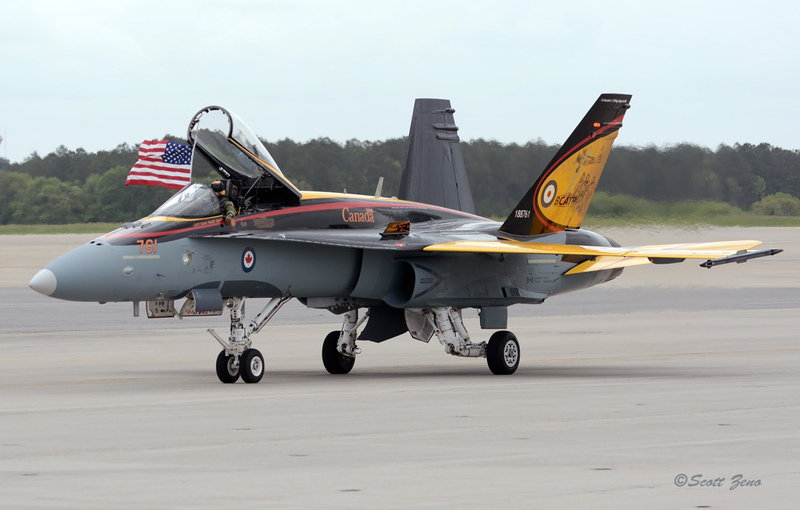 There were quite a number of historic planes displayed at the show, and more modern aircraft wore special colors that commemorated events that occurred while MCAS Cherry Point has been in operation. 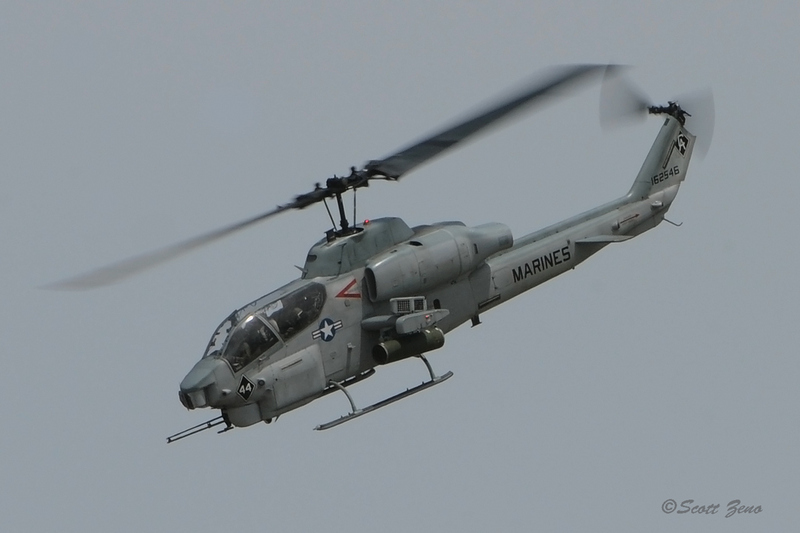 Here’s a review of many of the interesting sights and sounds seen during the three day event. 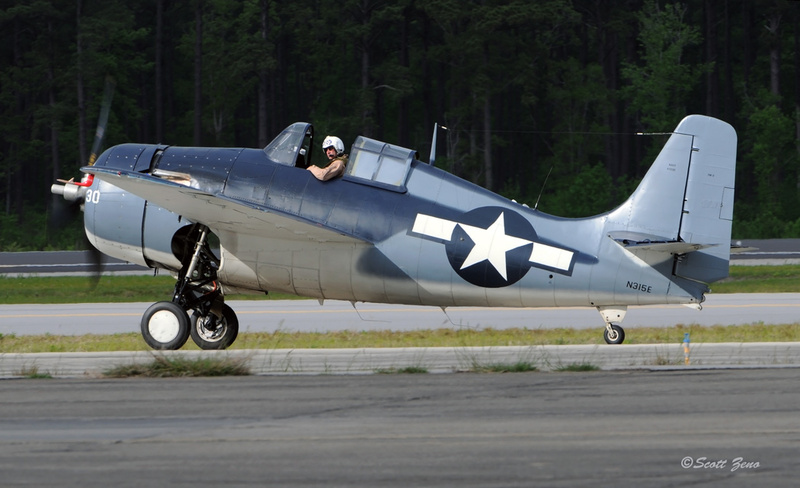 This new training and maintenance base in North Carolina was authorized by Congress in 1941, one of many that were planned just prior to the U.S.’s entry into World War II. 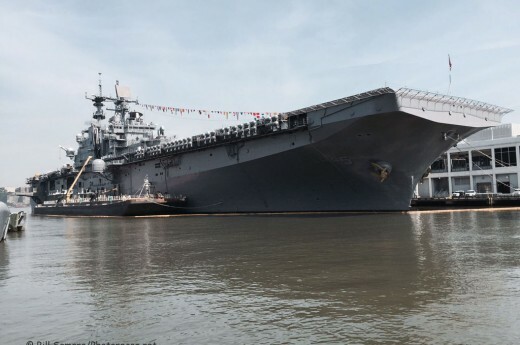 In fact, construction began some four months before the Pearl Harbor attack, but after the conflict in Europe began. 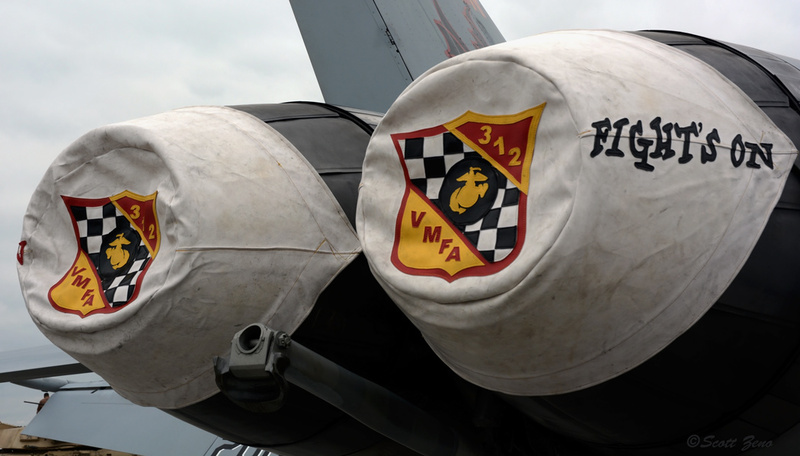 On May 20, 1942, the facility was commissioned as Cunningham Field, after the Marine Corps’ first aviator, Lieutenant Alfred Cunningham. 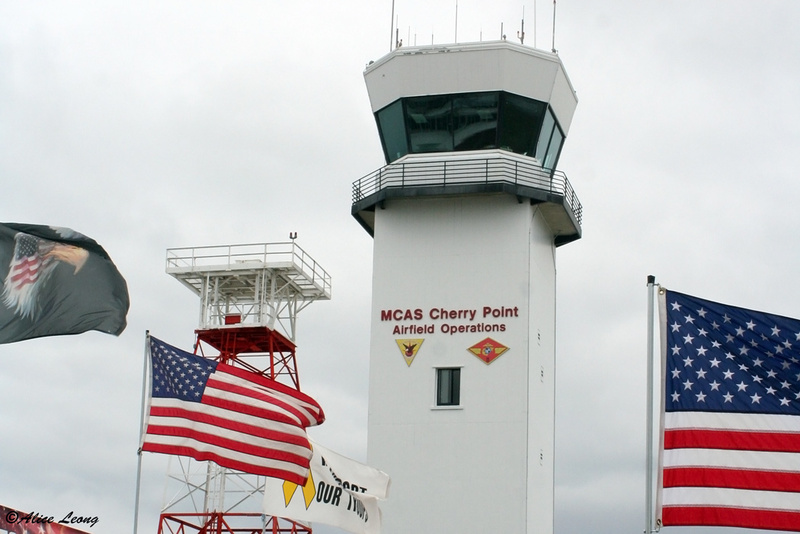 The base was soon renamed, and according to conflicting accounts it may have been from the wild cherry trees that grew along the nearby Neuse River, or possibly from the Post Office with the same name. 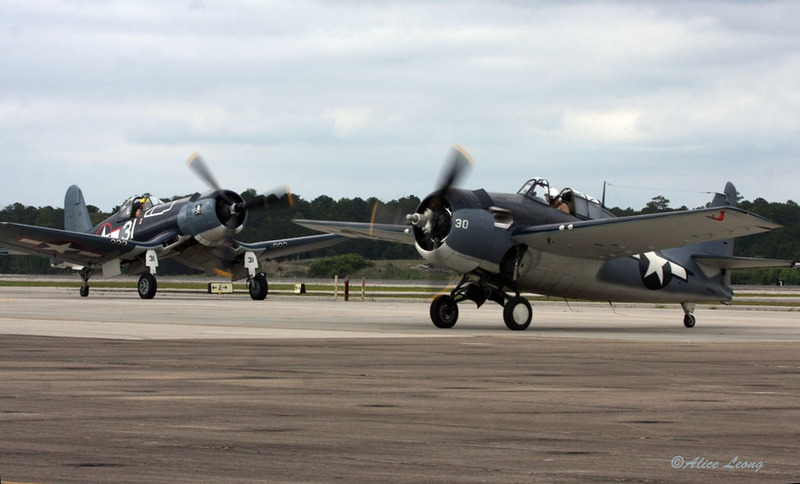 The main missions for the base during World War II included training aviation-related vocations and anti-submarine tasks. 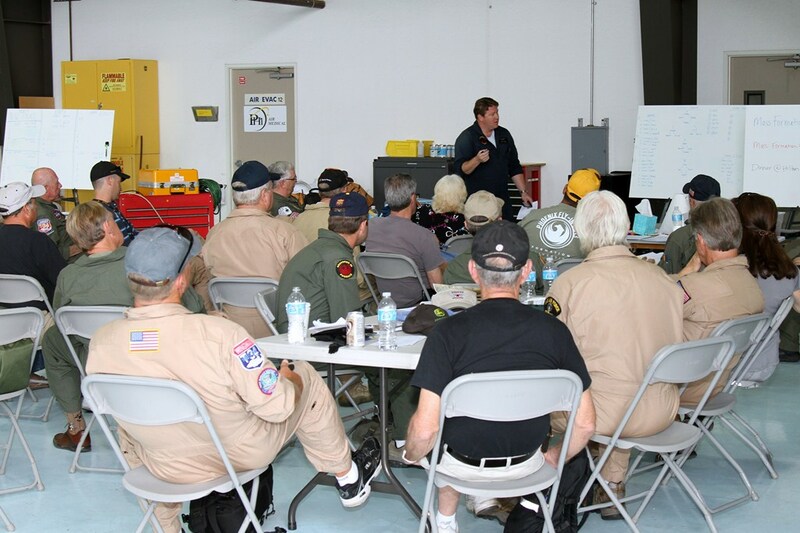 Aviation training, for both airborne and ground crew, remained the base’s focus after the war, and pilots and aircraft maintenance personnel were trained in assorted subjects before going off to fight in the Korean and Vietnam wars too. 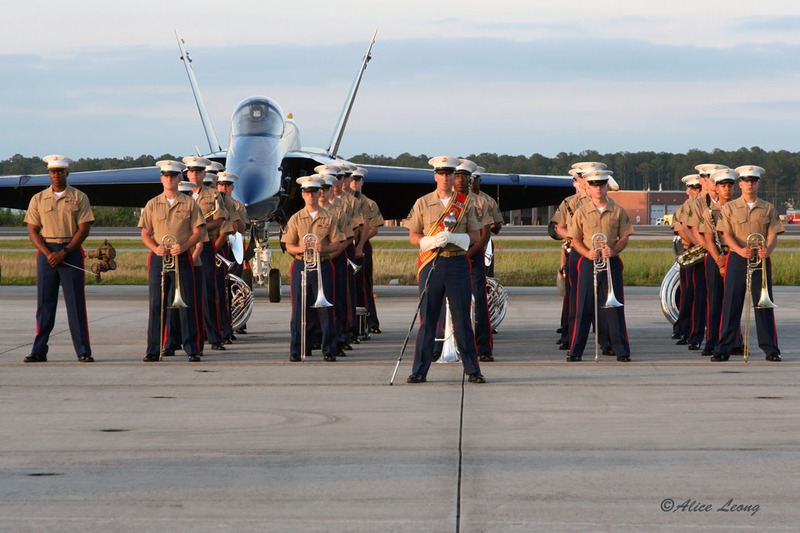 Training is still a large part of Cherry Point’s mission today, but the activity at the base has grown since World War II. 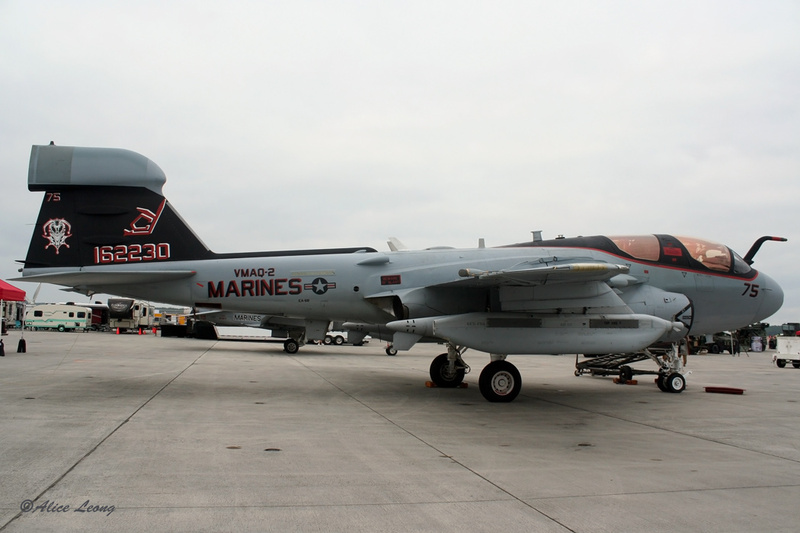 For example, the Fleet Readiness Center East maintains and overhauls aircraft for the entire DOD, not just Marine aircraft. 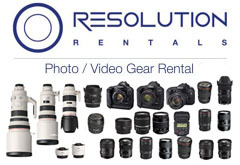 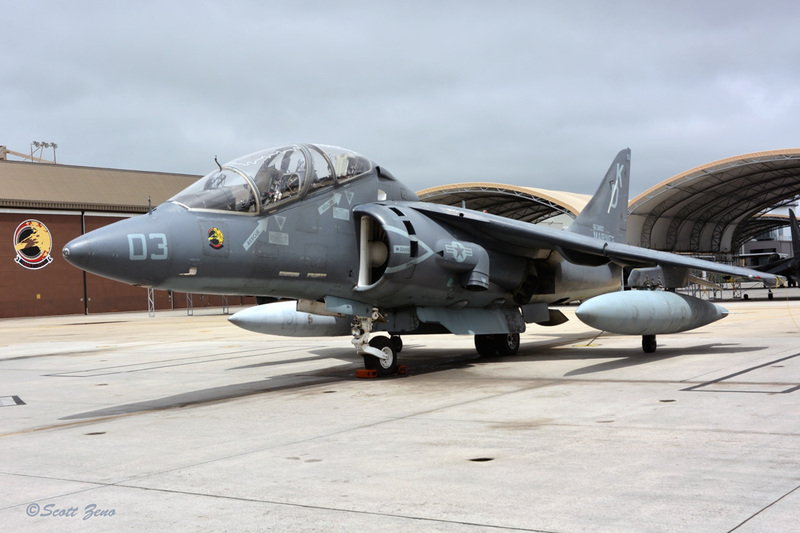 It has been in operation since 1943, and has serviced various airframes ranging from F4U Corsairs used during World War II and the Korean War, through today’s AV-8 Harriers and CH-53 Super Stallions. 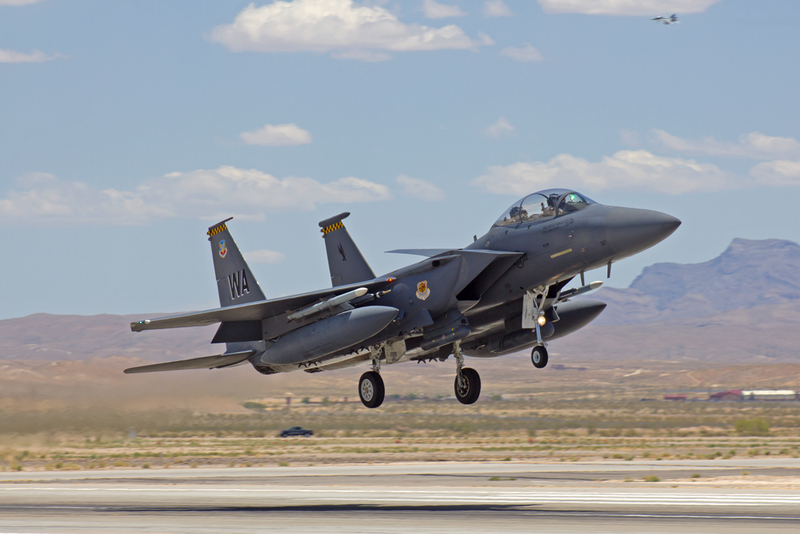 The Air Force, during the late 1950s and 1960s, established a radar unit at the field that fed into national air defense networks, including the SAGE system, but this function left years ago. 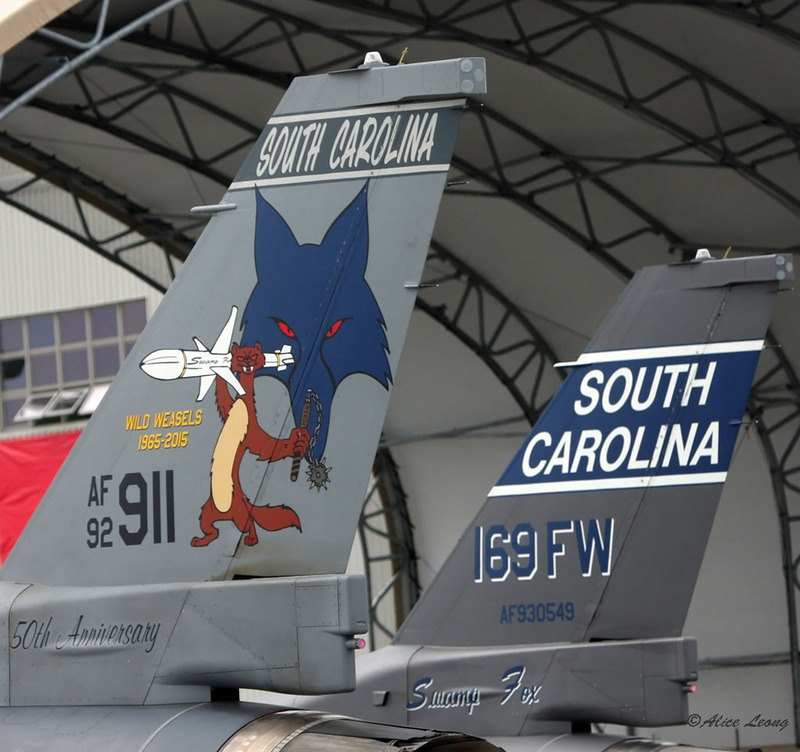 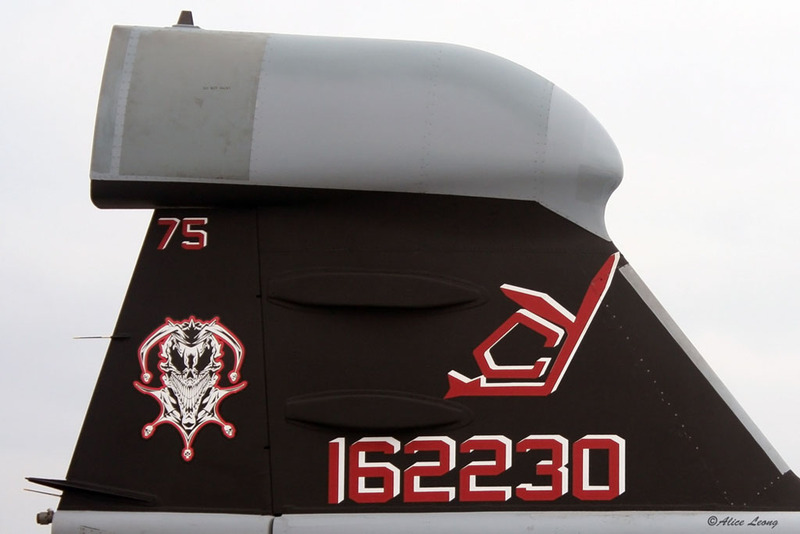 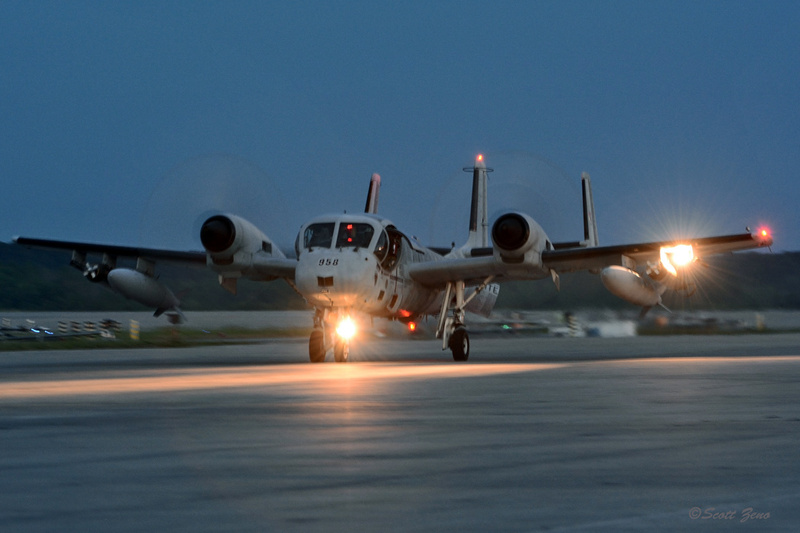 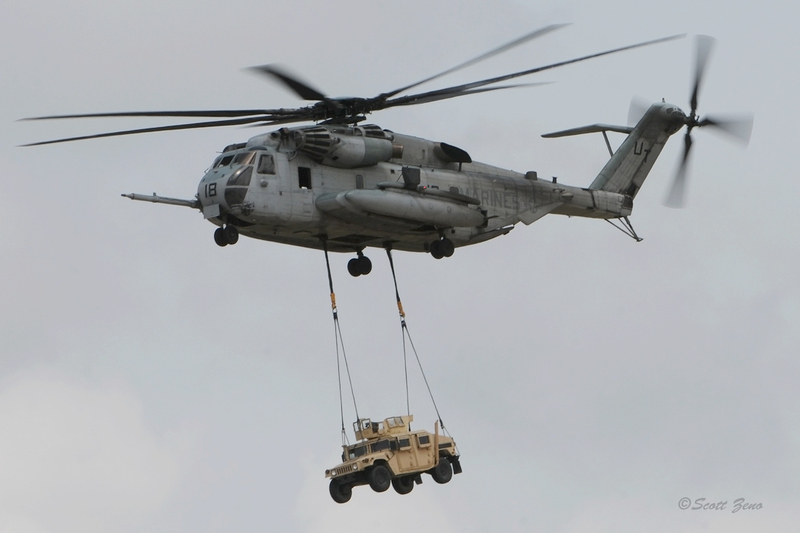 Squadrons of Marine attack and logistics aircraft have called Cherry Point home for decades. 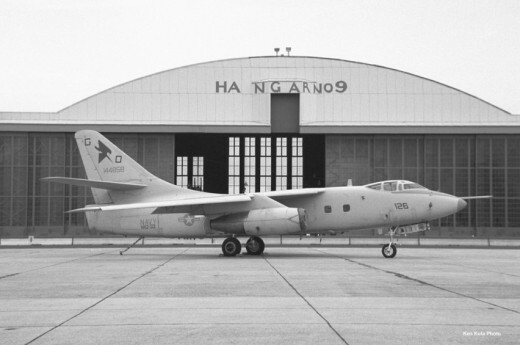 During the Vietnam War years through the first Gulf War, squadrons of McDonnell Douglas A-4 Skyhawks, Grumman A-6 Intruders and EA-6 Prowlers, and Lockheed C-130 Hercules were home-based here. 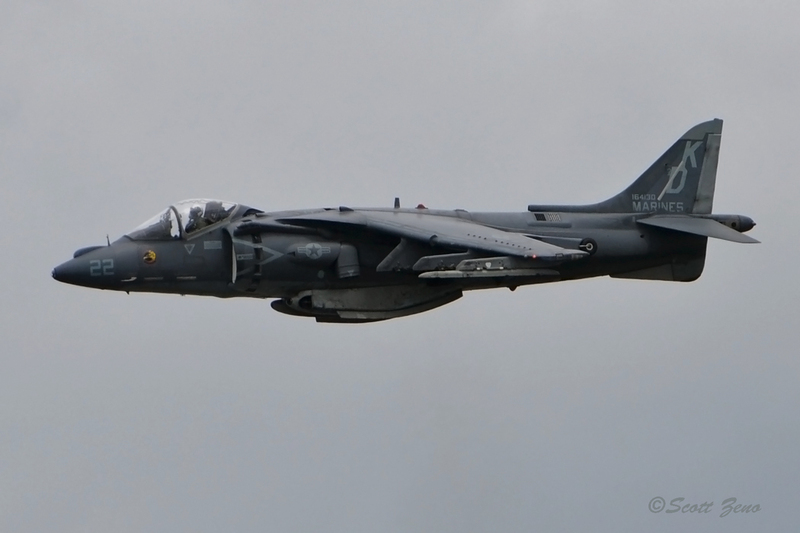 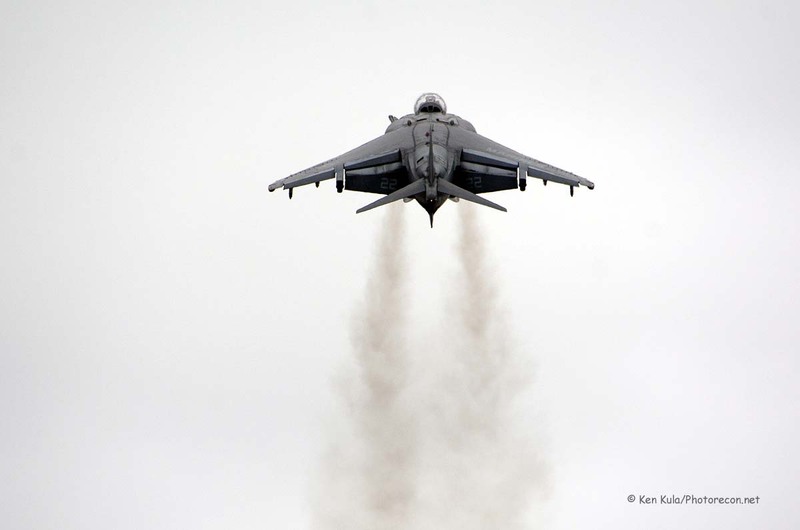 During the 1970s, the British Aerospace AV-8A and –C Harriers were introduced at Cherry Point, and Skyhawks were slowly retired, although the OA-4M Forward Air Control versions would not leave the base until 1990. 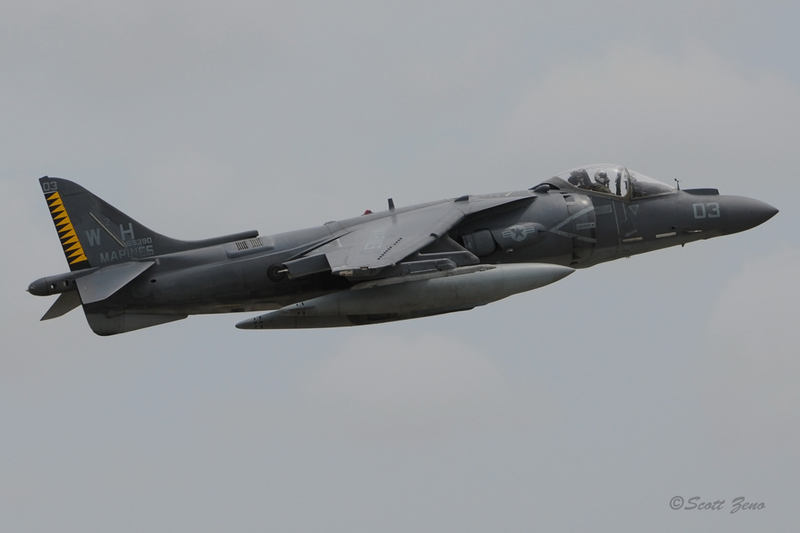 By the mid-1980s, the novelty of the Harrier had worn off and the design proven. 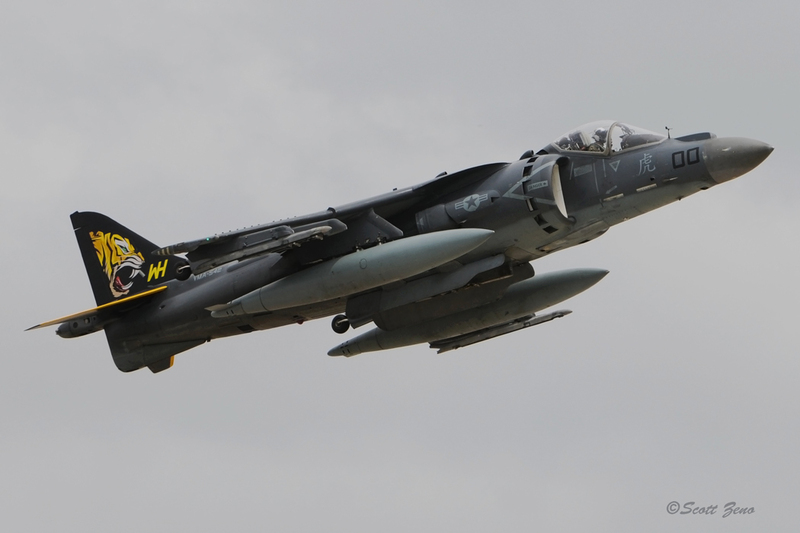 A newer redesign became the AV-8B Harrier II, and replaced the earlier versions during the late 1980s. 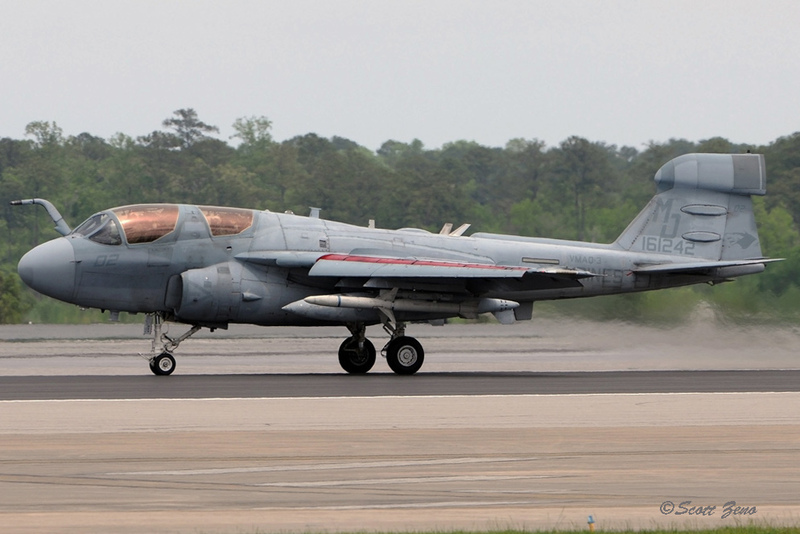 Today, the Cherry Point-based VMAT-203 squadron still trains all Marine AV-8B pilots in several versions of the V/STOL jet. 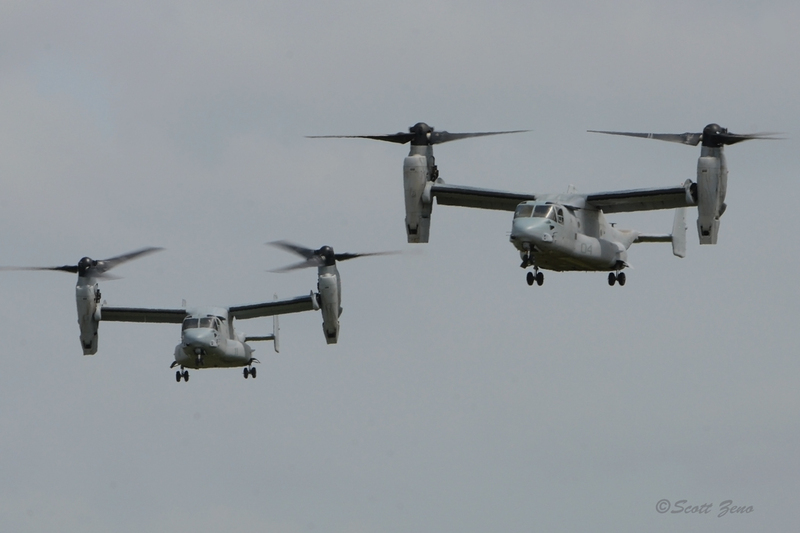 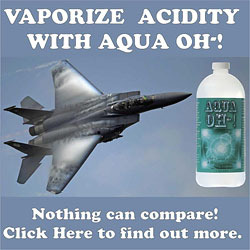 On the ground, not meant to be airborne, were a wide array of static display aircraft and vehicles. 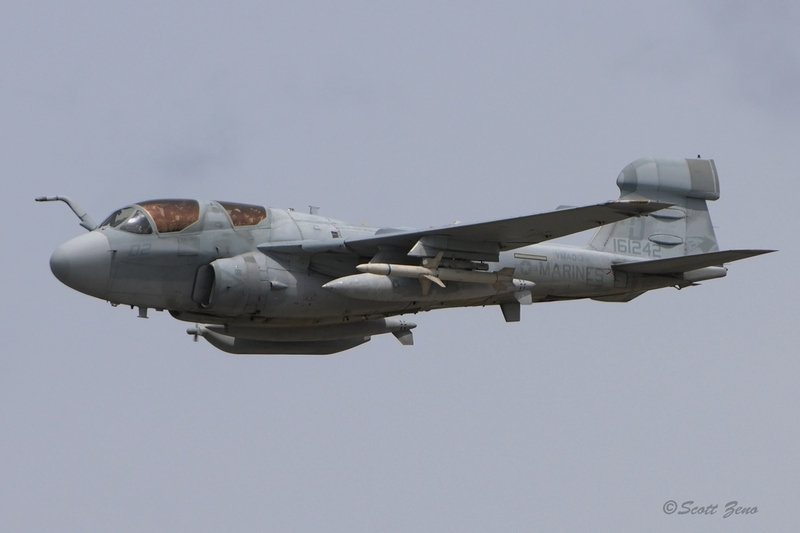 Of course, Marine aviation and equipment took center stage, with a Harrier, Hornet, two Prowlers, and a brand-new C-130J Hercules (just delivered from nearby Marietta GA with only 4 hours of flight time, we were told). 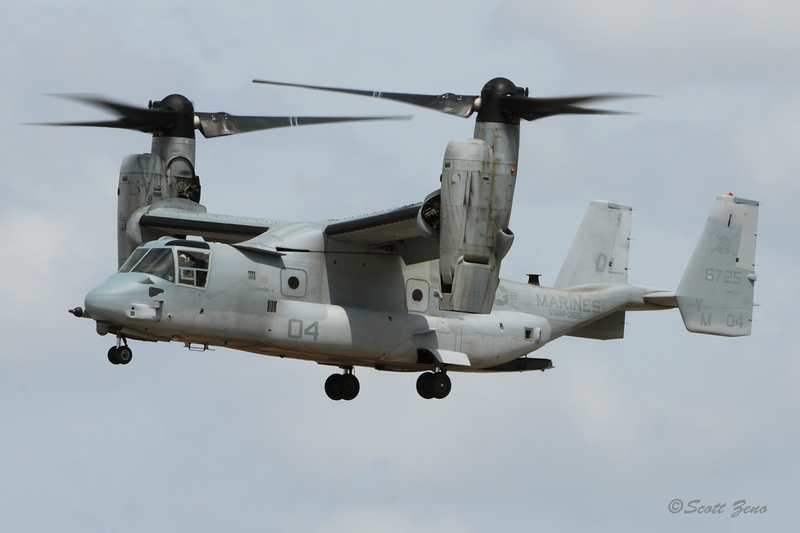 A MV-22B Osprey was open for inspection, and Cobra, Venom and Super Stallion helicopters had crew nearby to talk about their missions. 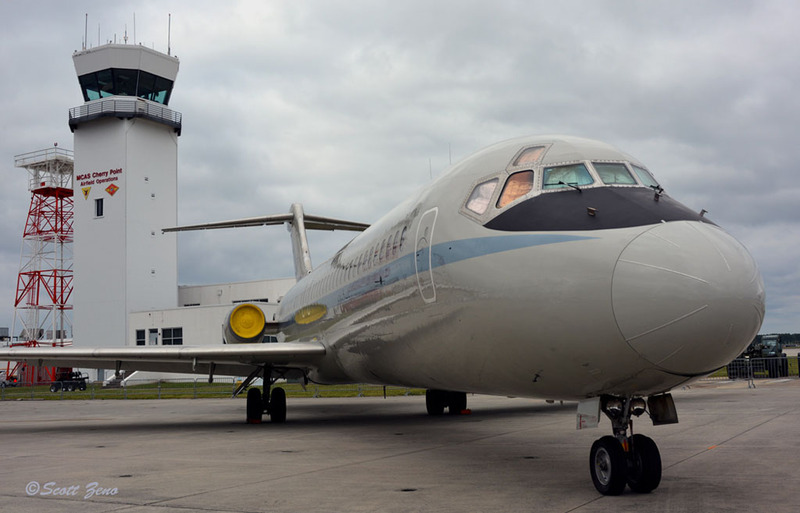 The locally-based transport squadron, VMR-1, displayed one of only two C-9 jet transports left in U.S. service; the cloth seats in the airliner-style jet were even embellished with a likeness of the Marine Corps Memorial statue (Iwo Jima Memorial) in Washington DC. 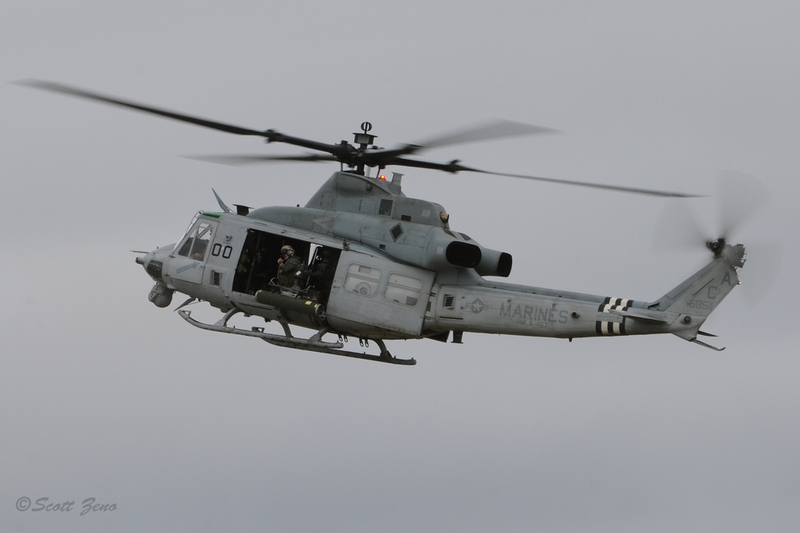 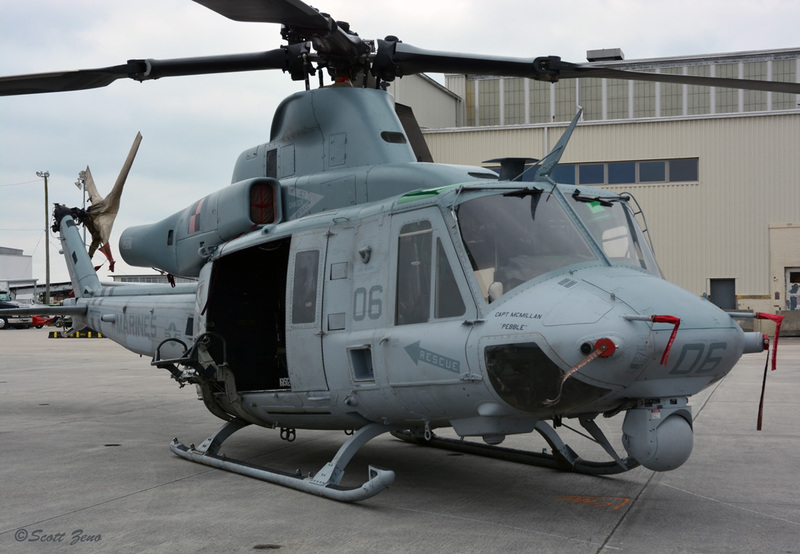 VMR-1 recently retired their last HH-46 “Pedro” rescue helicopters, which developed a well-respected reputation by Marines and local residents alike, for their rescues from the waters and lands around the base. 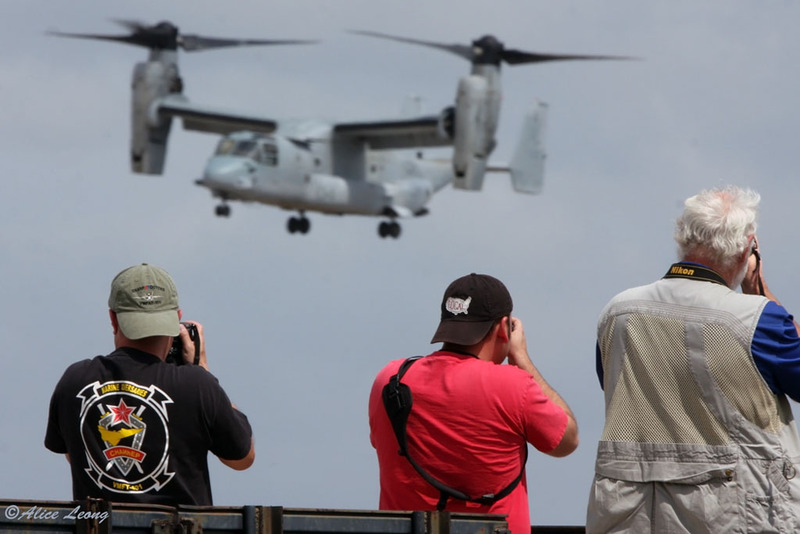 A pair of unmanned aircraft drew inquisitive spectators. 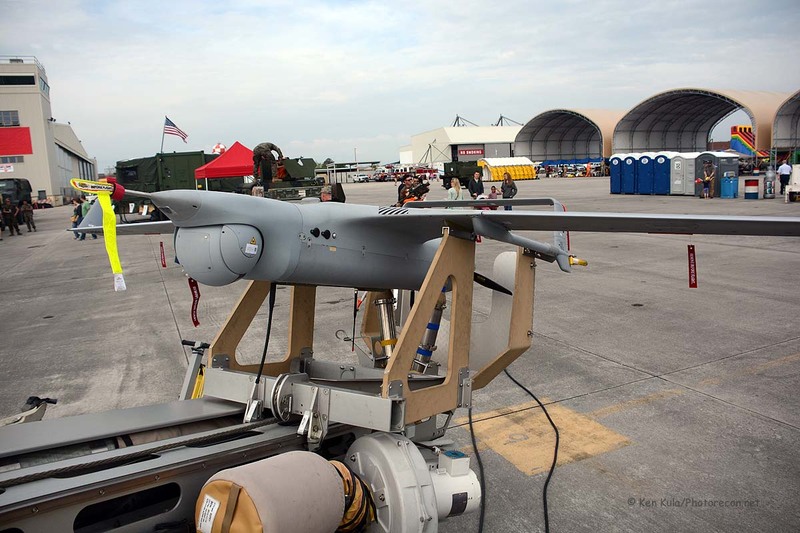 In fact, VMU-2, the UAV operating squadron, showed two UAVs off, a RQ-7 Shadow UAV which has been a Marine mainstay for years, and a RQ-21 Blackjack, the newest system for the Marines and Navy, just recently fielded. 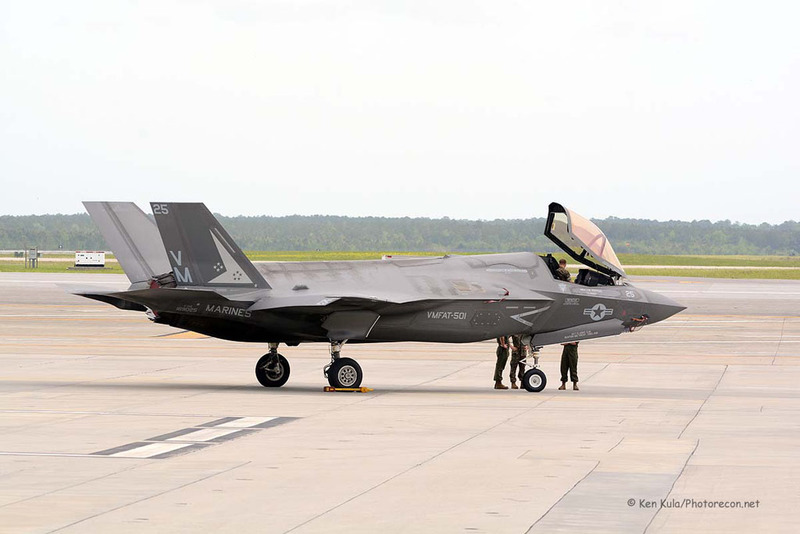 And, quite close to the main entry gate, a brand new Marine F-35B Lightning II (JSF) from the VMFAT-501 training squadron attracted almost as many aviators as spectators. 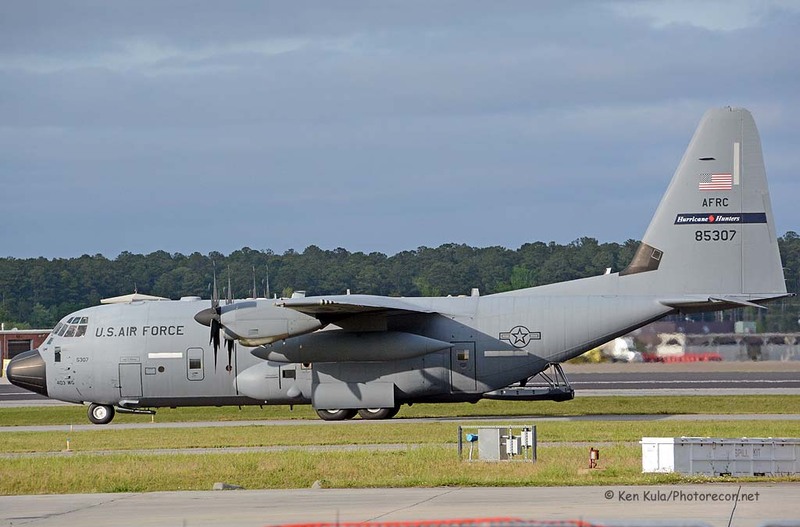 More military aircraft, ranging from Air Force B-52 and C-17 jets to F-15 and F-16 fighters and a Reserve WC-130J Hurricane Hunter were on hand. 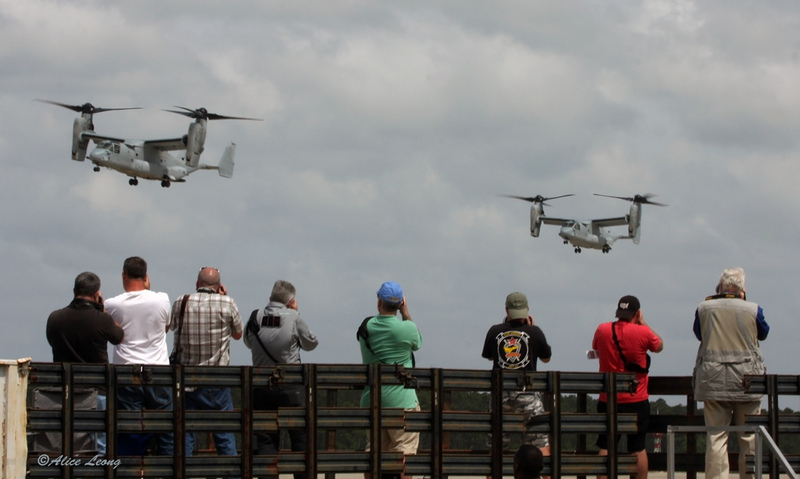 A Navy E-2 Hawkeye, an Army National Guard AH-64D Apache, plus a Canadian Forces C-130J Herc also were displayed. 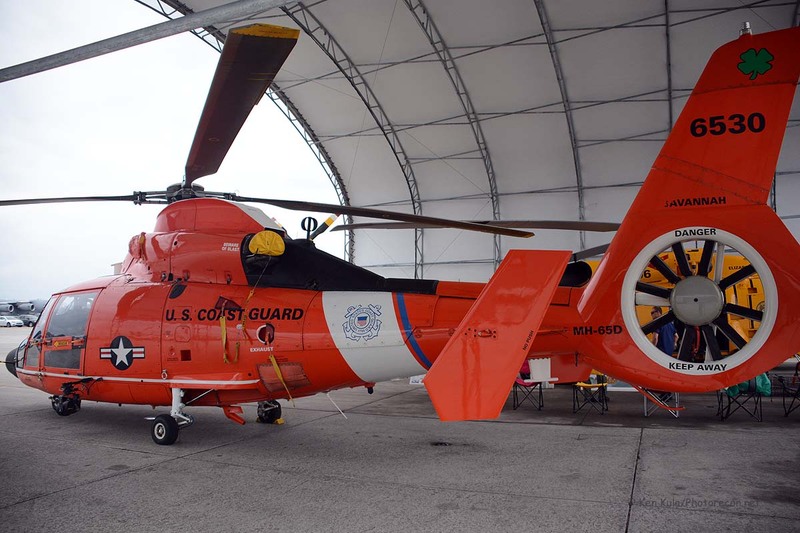 The Coast Guard brought two helicopters, a MH-65D and a MH-60T; the latter was painted bright yellow in commemoration of the 100th anniversary of Coast Guard Aviation this year. 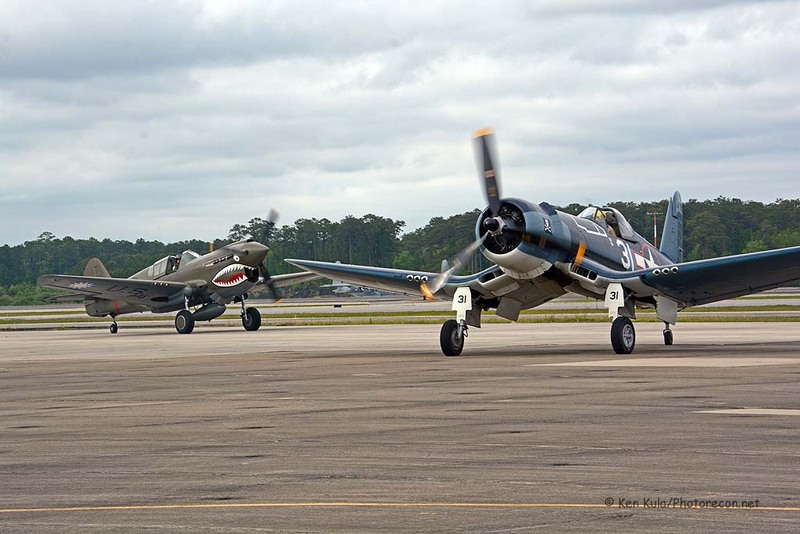 A group of warbirds represented some of the different time periods from the base’s inception up through recent history. 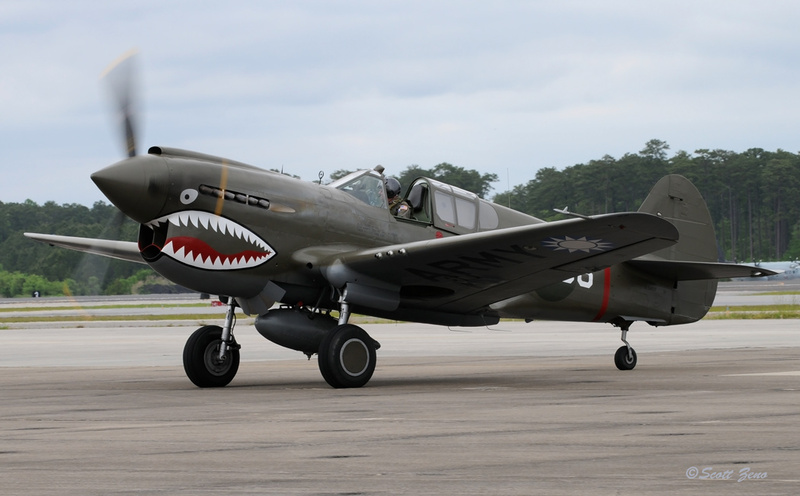 The Military Aviation Museum, from nearby Virginia Beach, Virginia (a 35-minute hop for these planes to Havelock), presented a Navy SNJ-2 trainer and World War II vintage fighters in the forms of a FM-2 Wildcat, a P-40E Kittyhawk and a FG-1D Corsair – the latter type served during the Korean War as well. 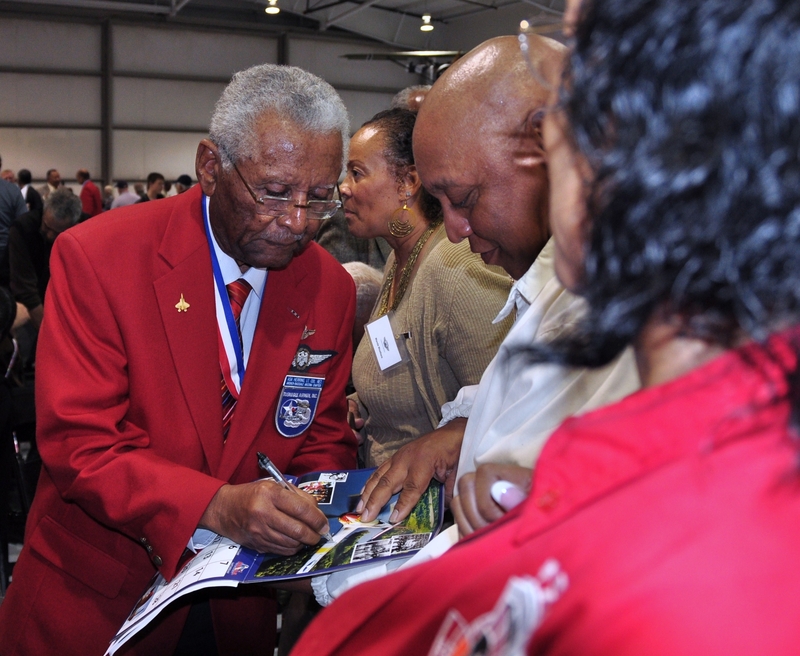 The Commemorative Air Force’s Red Tail Squadron travelling exhibit opened the doors to their Rise Above trailer, telling the story of the Tuskegee Airmen. 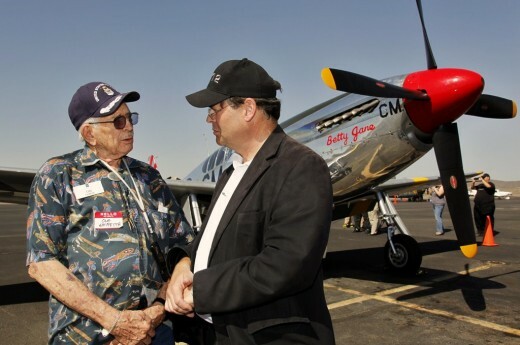 Triple Tree Airdrome’s F-51D Mustang accompanied the exhibit too. 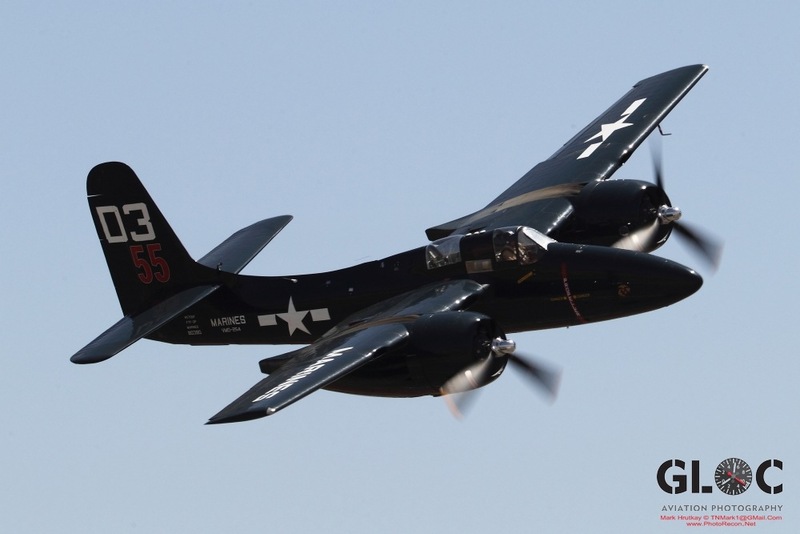 The Curtiss C-46 Tinker Belle, B-25 Panchito, and a 1960’s vintage Focke-Wulf FW-149D liaison/training aircraft rounded out the static warbird aircraft on display. 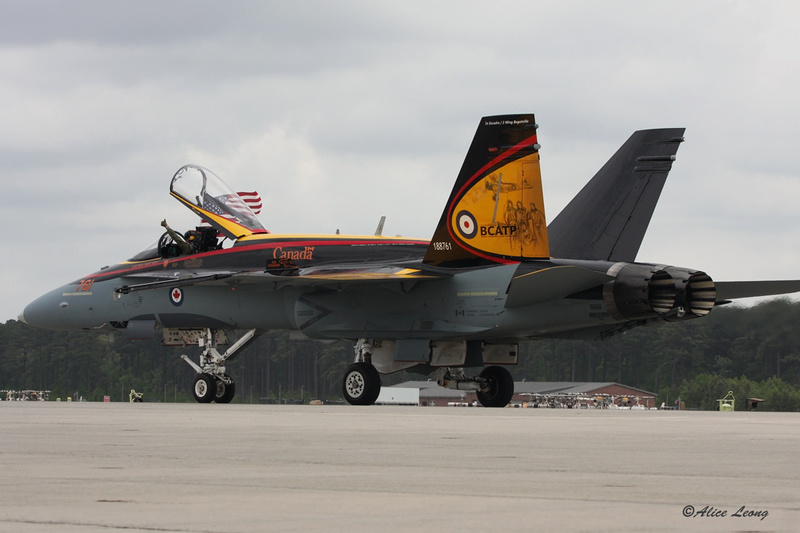 A pair of visitors from Canada also gave a historic look back at the early Cherry Point years, but through a slightly different point of view. 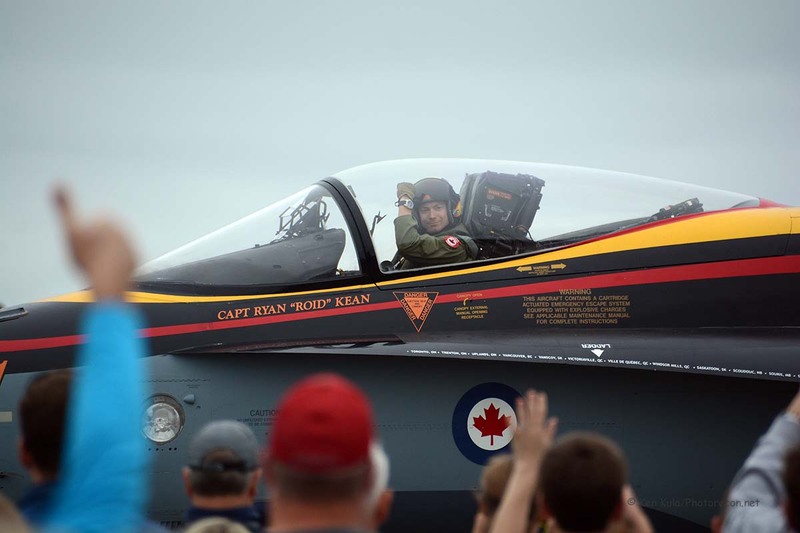 This year’s Canadian Forces CF-18 Hornet demonstration aircraft wears commemorative British Commonwealth Air Training Program yellow and red colours, and the pilot, Captain Ryan Kean, showed them off dazzlingly during the flying show. 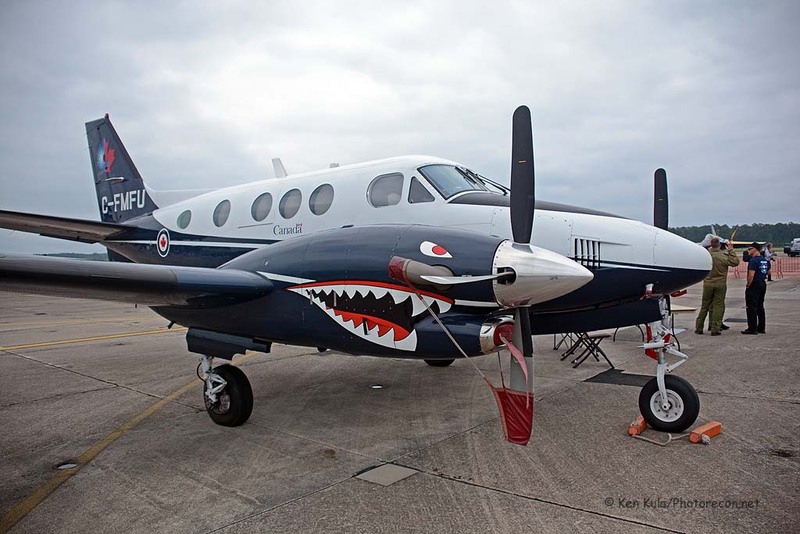 A companion aircraft, a static Beechcraft C-90 King Air used for Canadian military multi-engine training, wore the nose art of “Pistol Packin’ Mama”, a World War II RCAF heavy bomber. 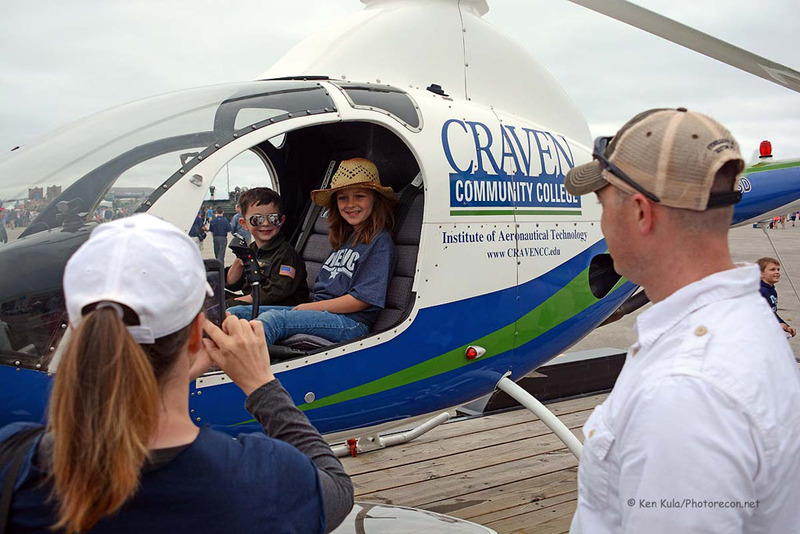 Civilian owned and operated static aircraft included a Rotorway Exec 162 helicopter displayed by nearby Craven Community College. 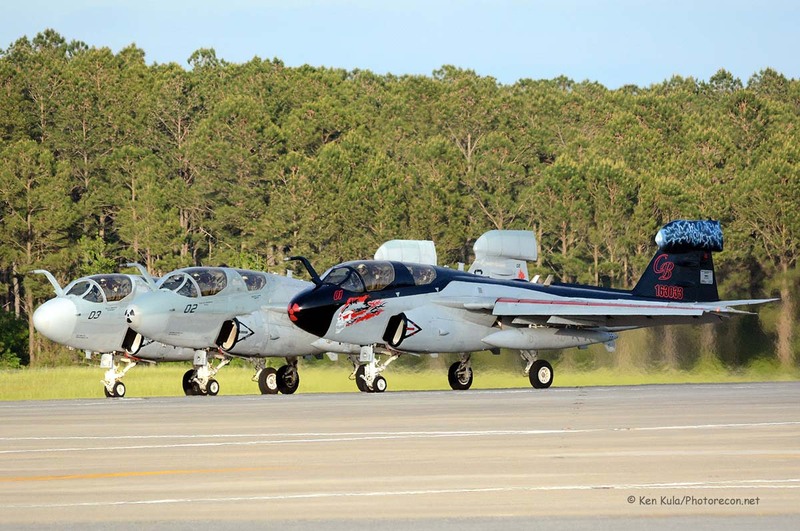 Now offering an airframe and powerplant certification program, future plans include an avionics program and flight training in the next few years. 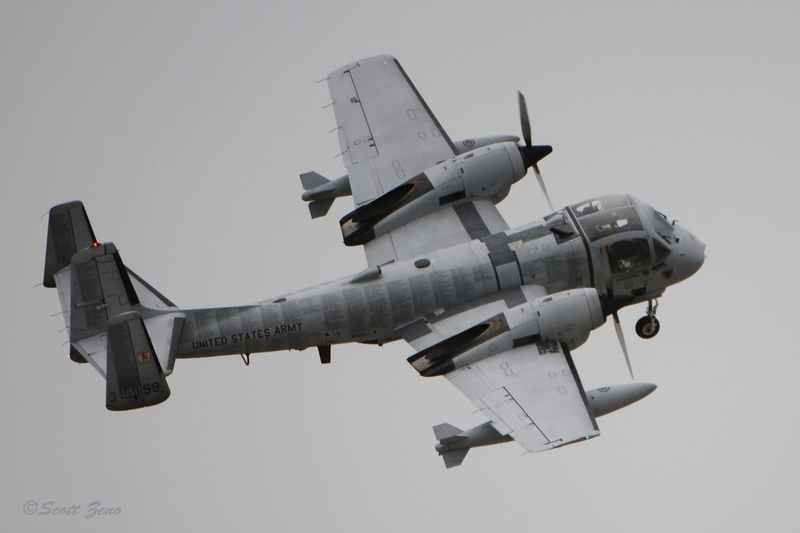 An IOMAX Archangel surveillance/security aircraft, almost ready to be delivered to the United Arab Emirates, was displayed by the manufacturer – it is a Thrush agricultural airframe fitted with sophisticated surveillance and weapons systems. 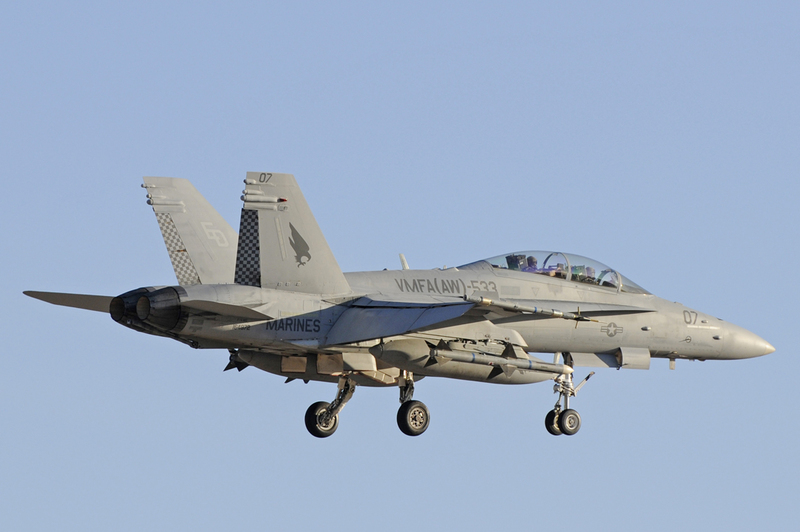 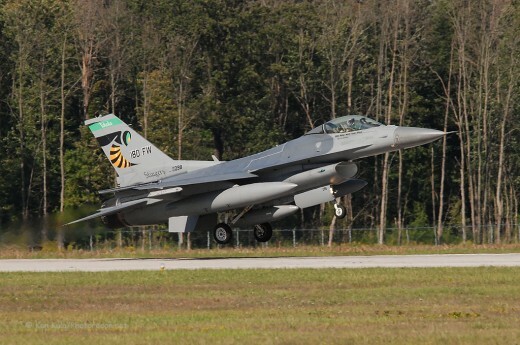 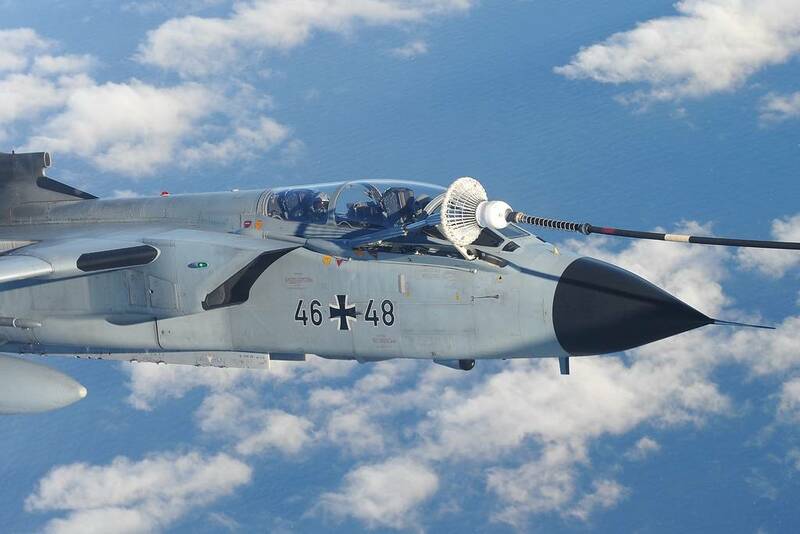 With an endurance of over 9 hours under certain conditions, 48 have been ordered by foreign operators, and U.S. interest may develop into orders at some future point. 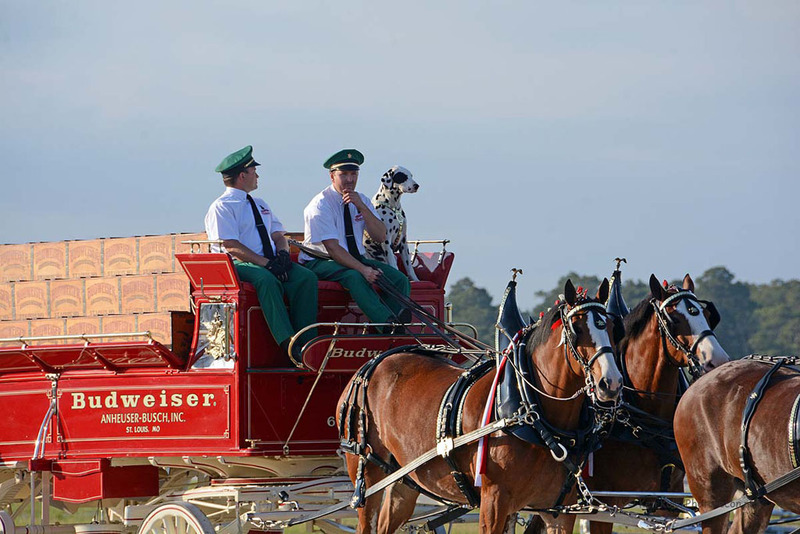 Non-flyable attractions included both ends of the land-speed spectrum… the Budweiser Clydesdales and the Flash Fire jet truck. 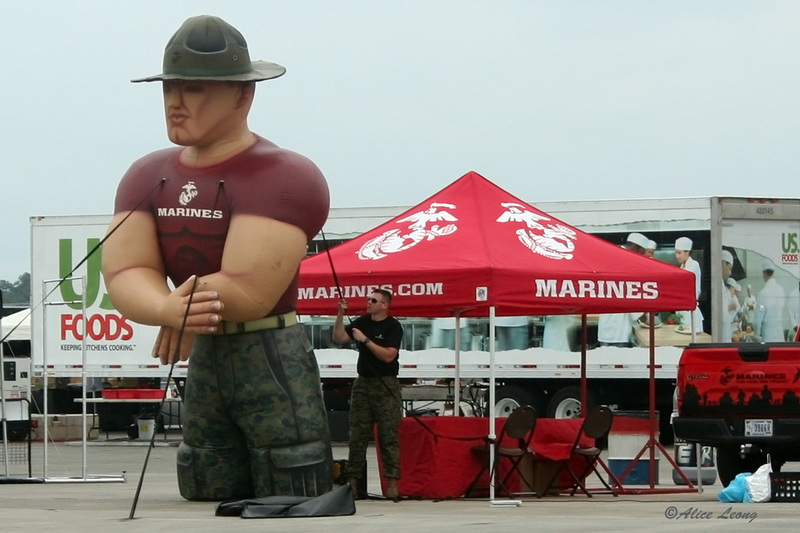 The 2nd Marine Aircraft Wing Band provided a crisp opening to each air show with marches and the Star Spangled Banner. 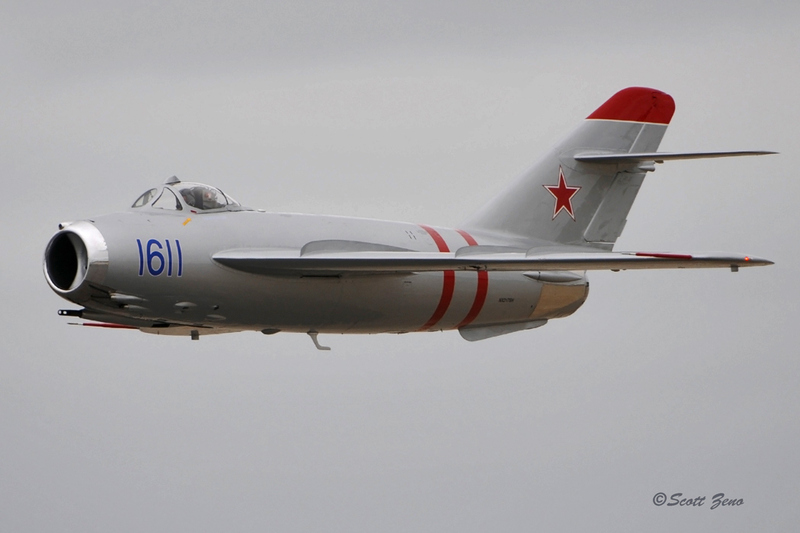 This event had close to 16 hours of flying planned, although weather conditions muted this sparkling schedule a bit. 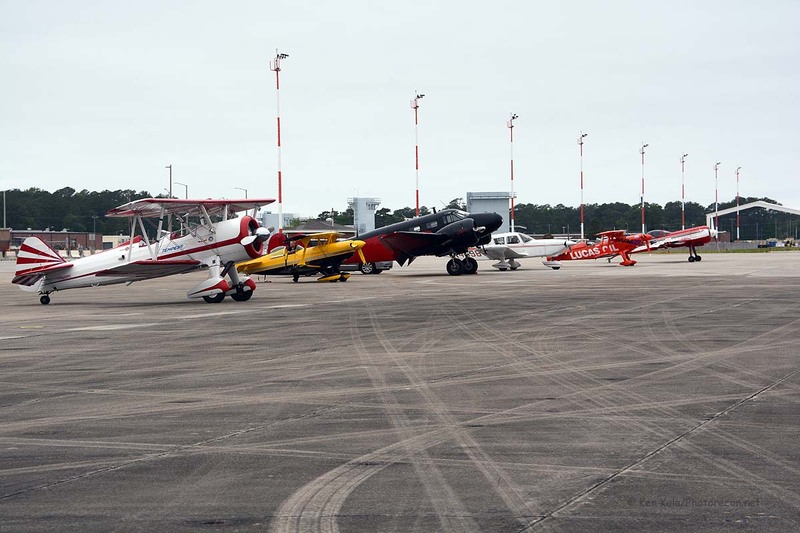 Winds off of the nearby Neuse River and Pamlico Sound brought low clouds that reduced ceilings and visibilities at times. 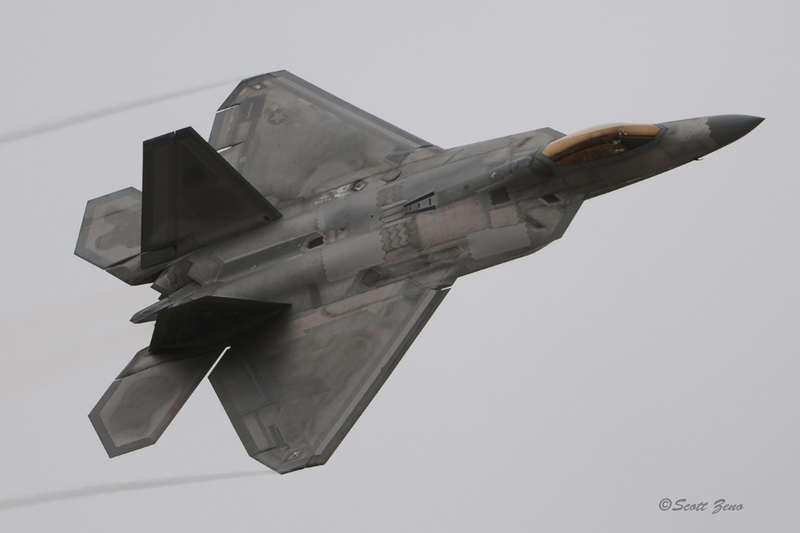 Friday practices were somewhat curtailed, although it cleared wonderfully in time for the evening air show to go on as planned. 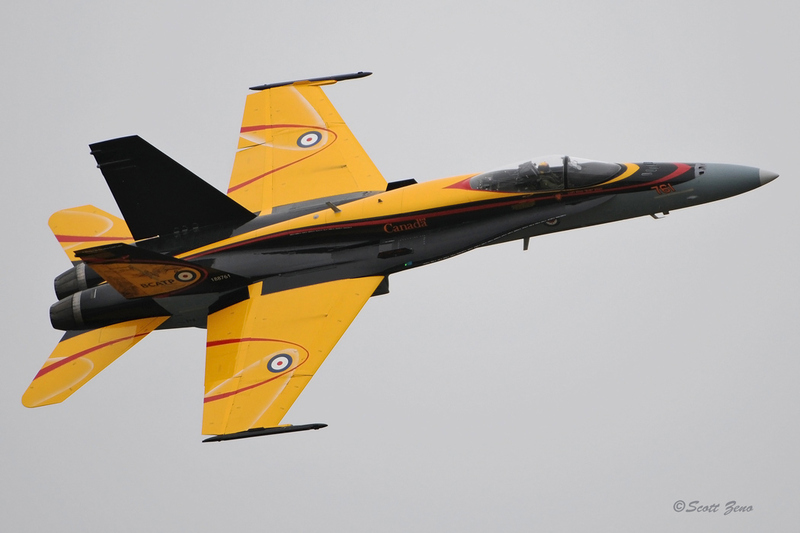 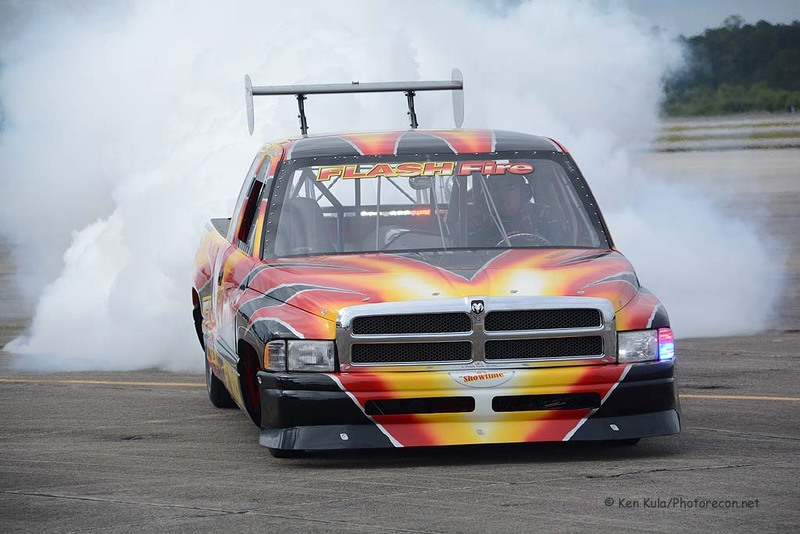 Saturday was forecast to have the better conditions of the two weekend days, but ceilings lowered and many of the fast jets in that day’s show were grounded. 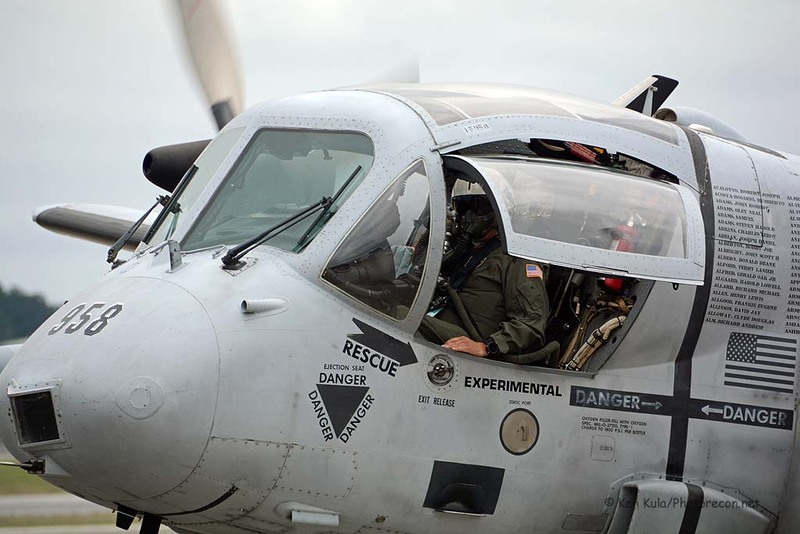 On Sunday, the same winds were more of an ally than an enemy though, as heavy storms were pushed north of the base and ceilings rose. 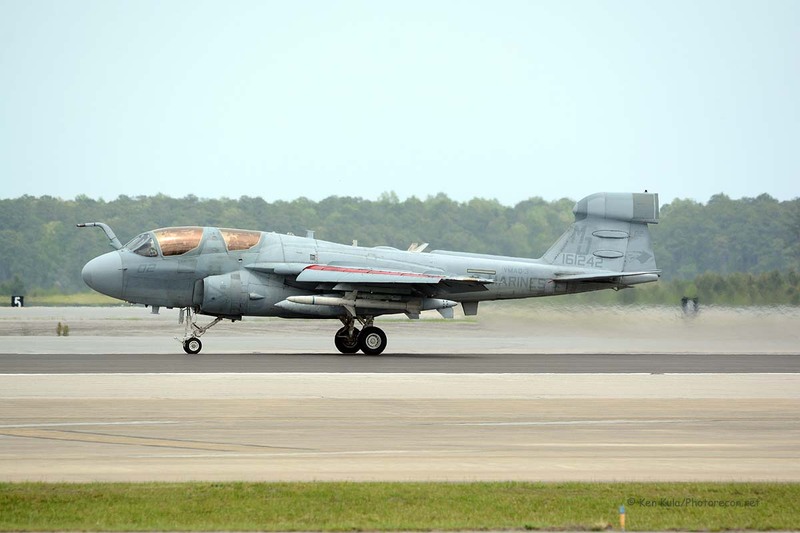 A Marine EA-6B Prowler electronic warfare squadron, VMAQT-1, had its disestablishment ceremony at the beginning of the three-hour long Friday evening air show. 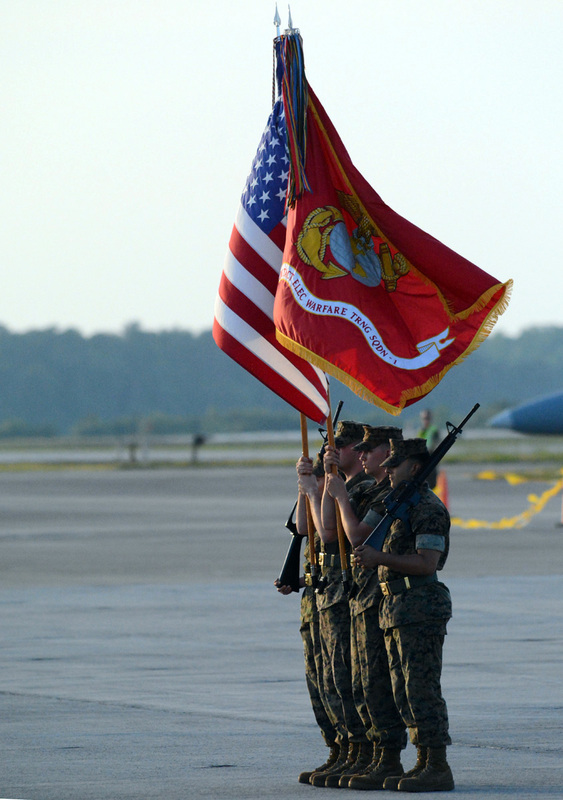 A long and storied history was read as their colors were flown for the last time; the squadron had roots back to Marine Composite Squadron One (VMC-1) that began operations during the Korean War in the 1950s. 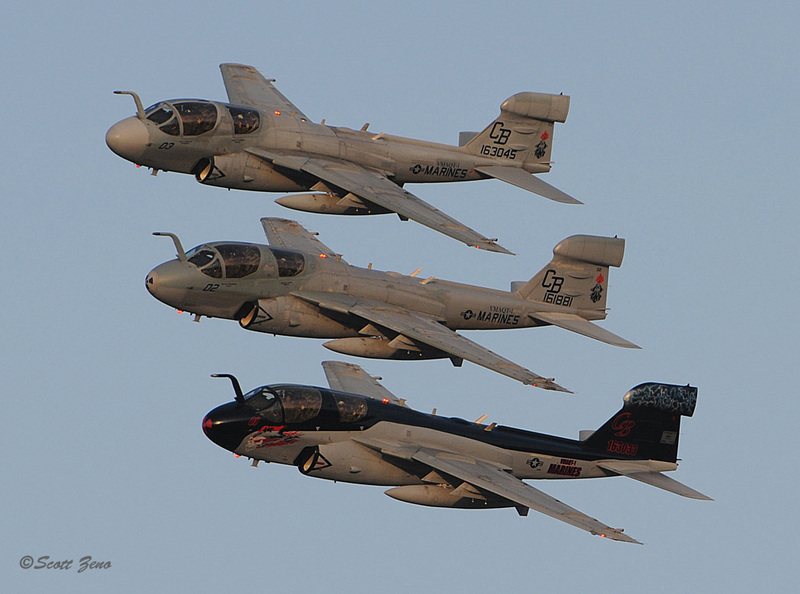 A memorable three-ship echelon fly-past of EA-6Bs helped draw the ceremony to a close, as the sun set. 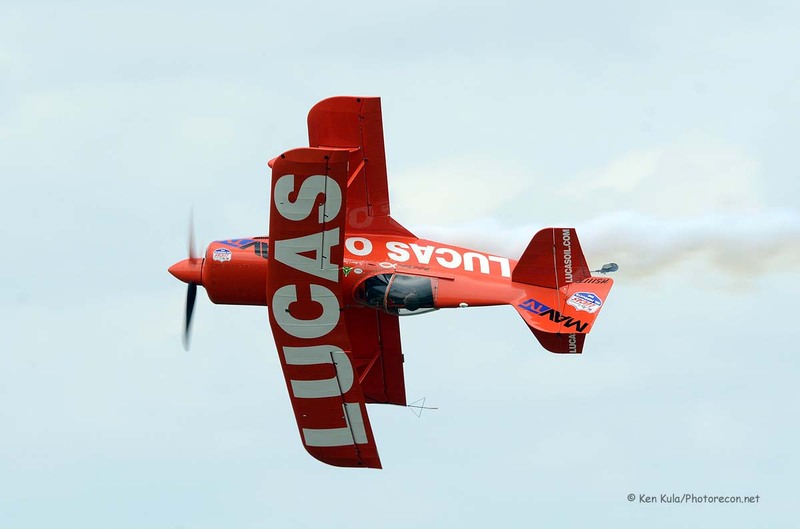 Civilian performers during the weekend included the Lucas Oil Parachute Team and Lucas Oil-sponsored Mike Wiskus in his Pitts Special. 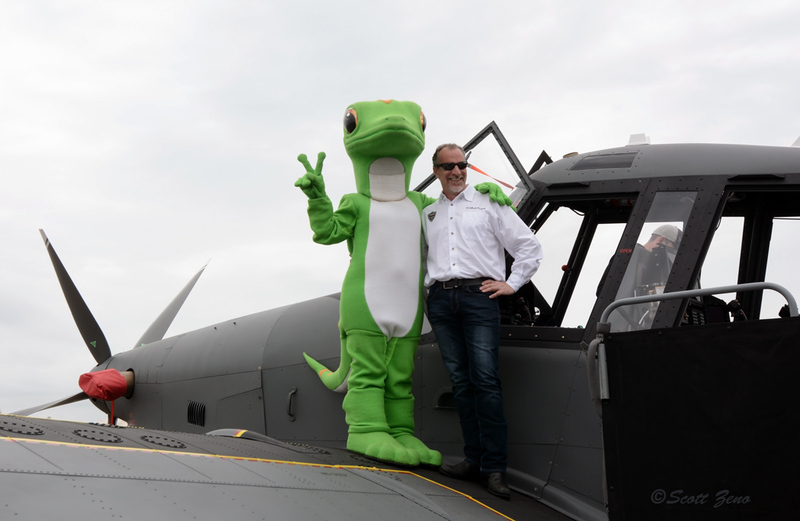 Buck Roetman presented his Wildhorse Aviation Pitts aerobatics too. 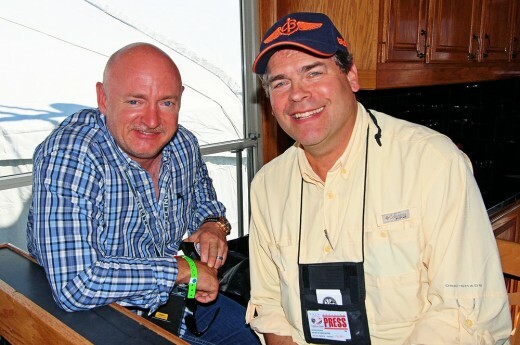 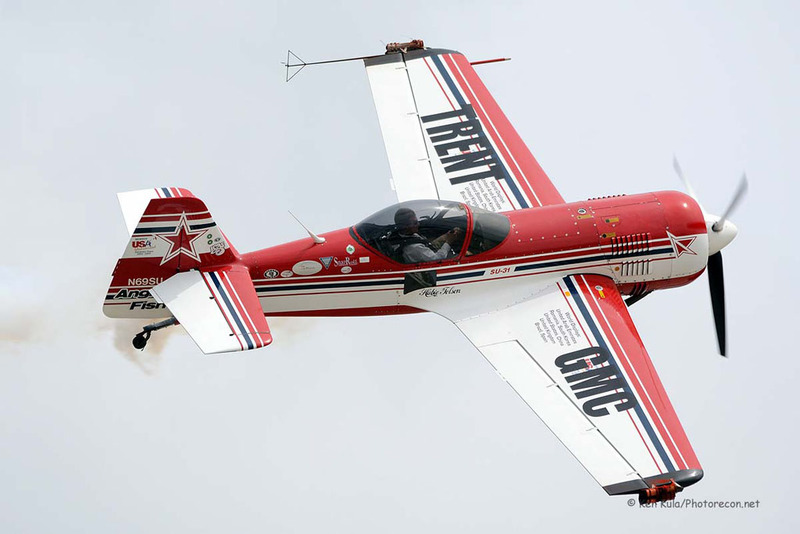 Gary Rower flew more aerobatics in his modified Stearman biplane, and Hubie Tolson gave more thrills to the crowd in his Sukhoi SU-31 monoplane. 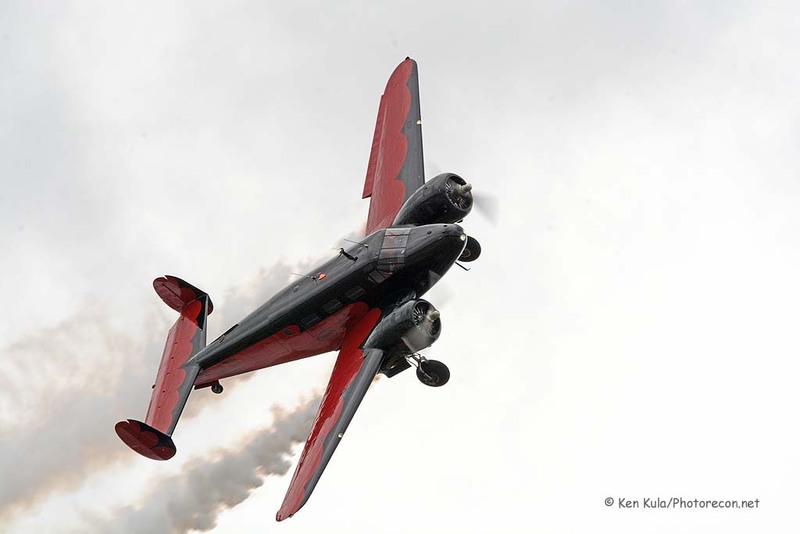 Finally, in a graceful yet powerful flying display, Matt Younkin flew his red and black Beech 18, trailing thick smoke, each day too. 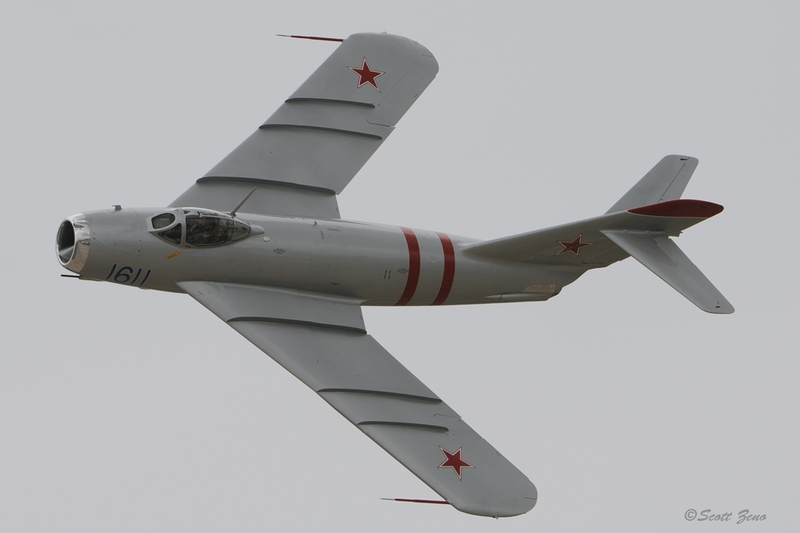 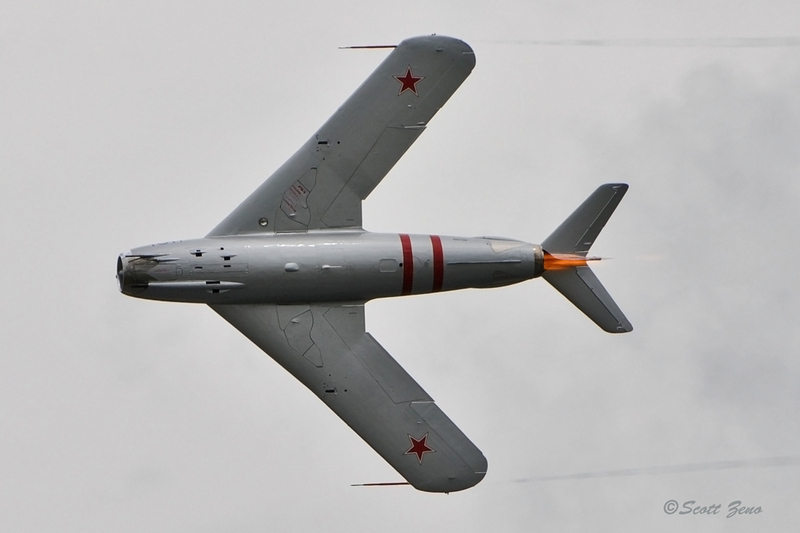 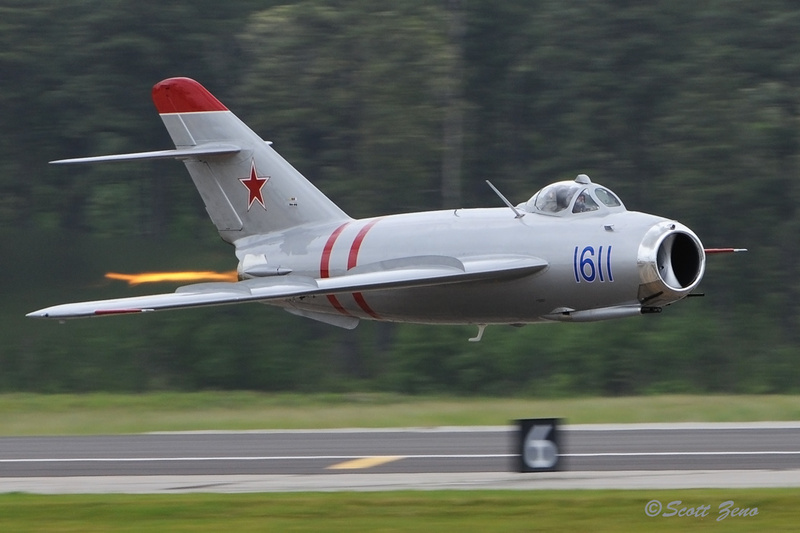 Randy Ball flew his Vietnam-era MiG-17F jet fighter three times during the show, showing off ultra-low level flying, with high speed afterburner and graceful turning passes in front of the crowd. 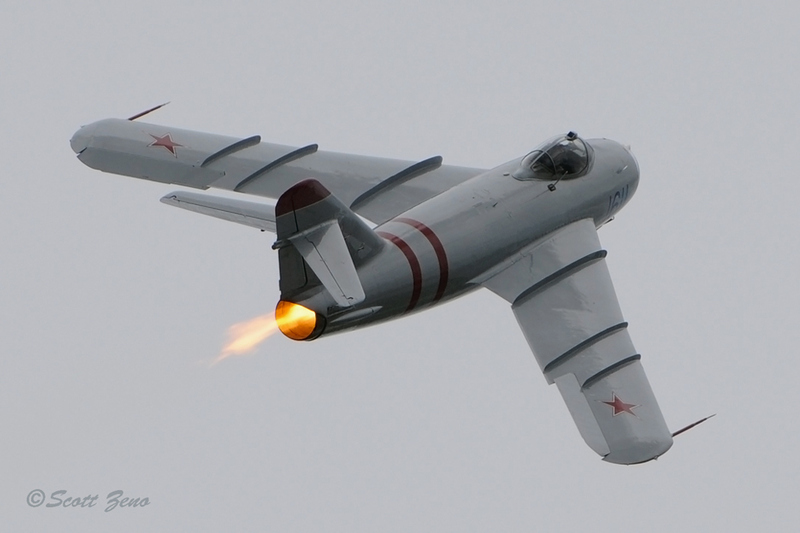 The ‘burner on the MiG at night yields quite a bright orange flame. 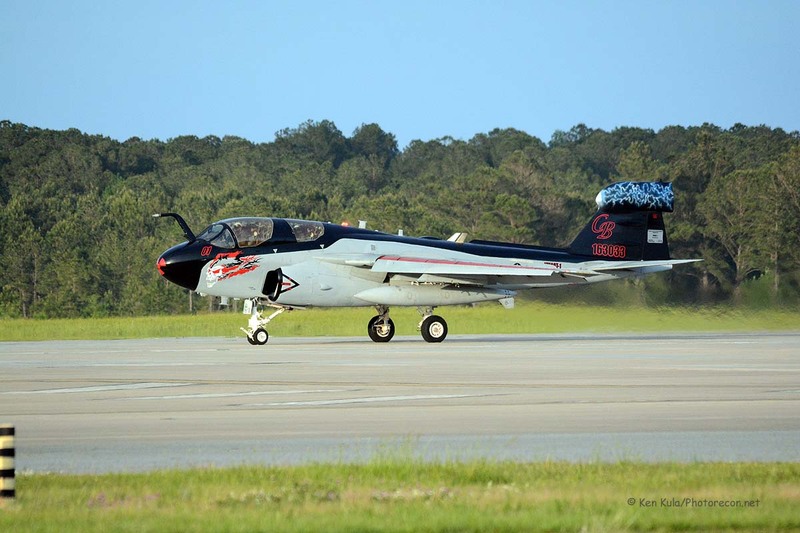 Dr. Joe Masessa performed a trio of flying shows in his Vietnam-era Grumman OV-1D Mohawk; the aircraft is emblazoned with 1,636 names of men and women who are still unaccounted for, and still missing in action from the Vietnam War. 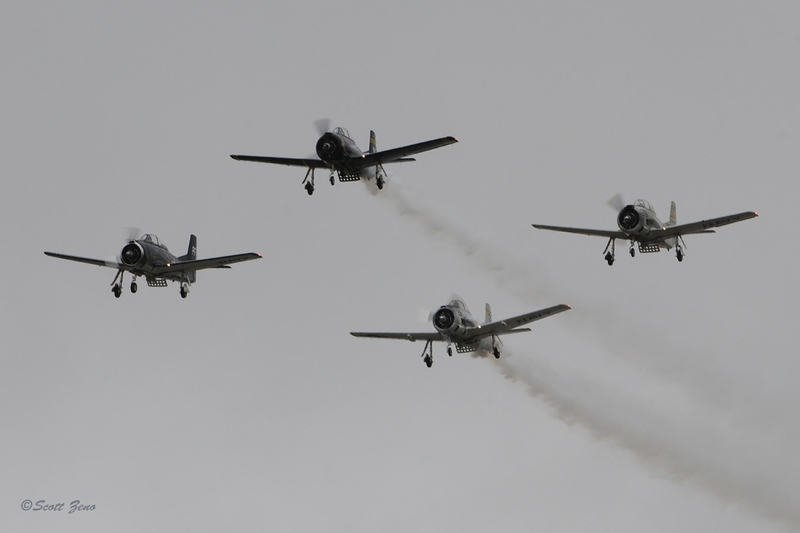 And a pair of six-ship prop-driven civilian flying teams – the GEICO Skytypers in their SNJ-2s and the Trojan Horsemen in their T-28s filled the sky with smoke and thunder from their radial engines. 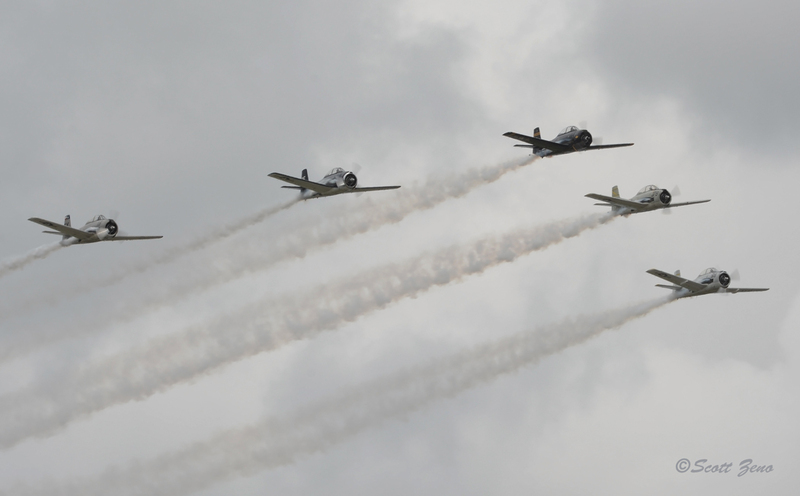 Military flying performances offered a ringside seat to some of the “heavy hitters” of aerial warfare in action. 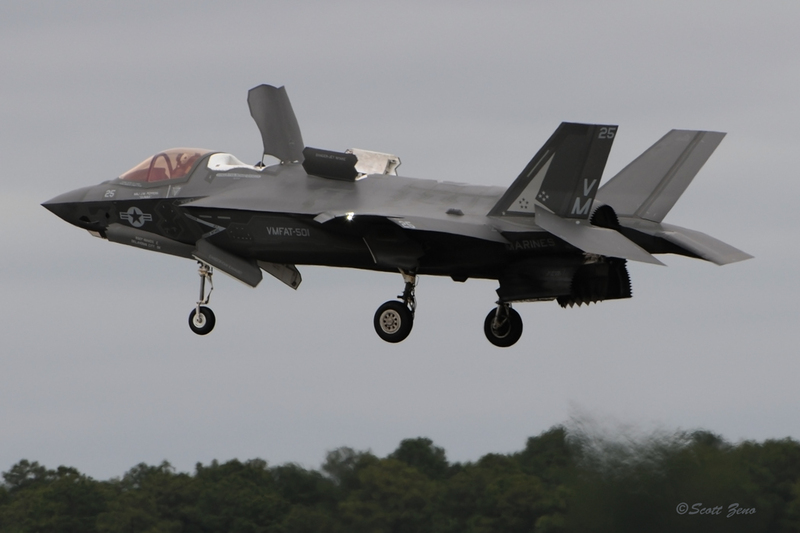 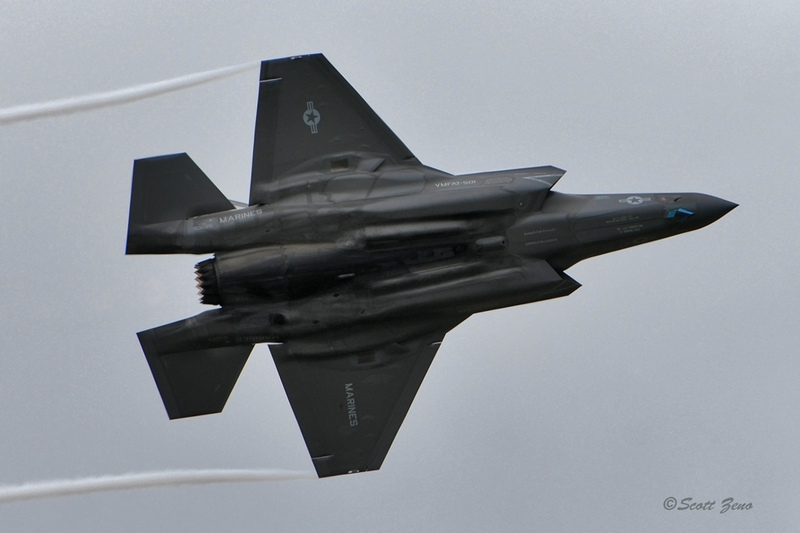 The Air Force’s F-22 Raptor and Marine AV-8B Harrier demonstrations were loud and fast paced, and the new Marine F-35B also lived up to that description. 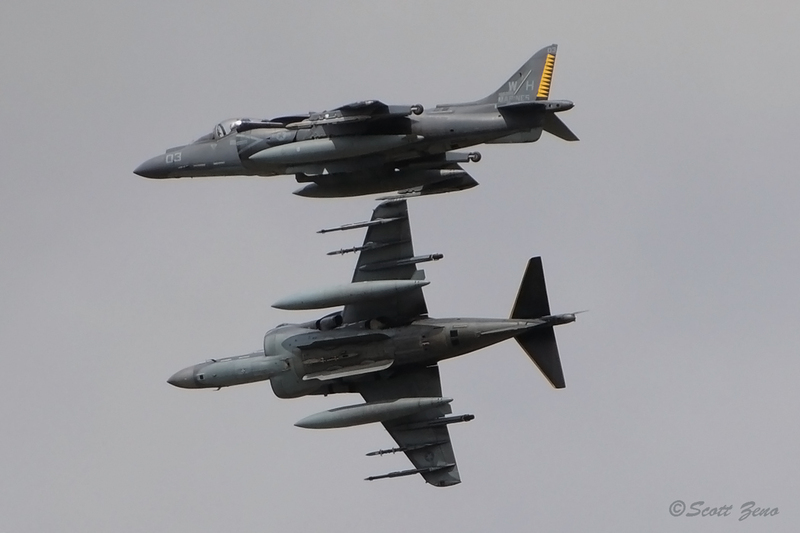 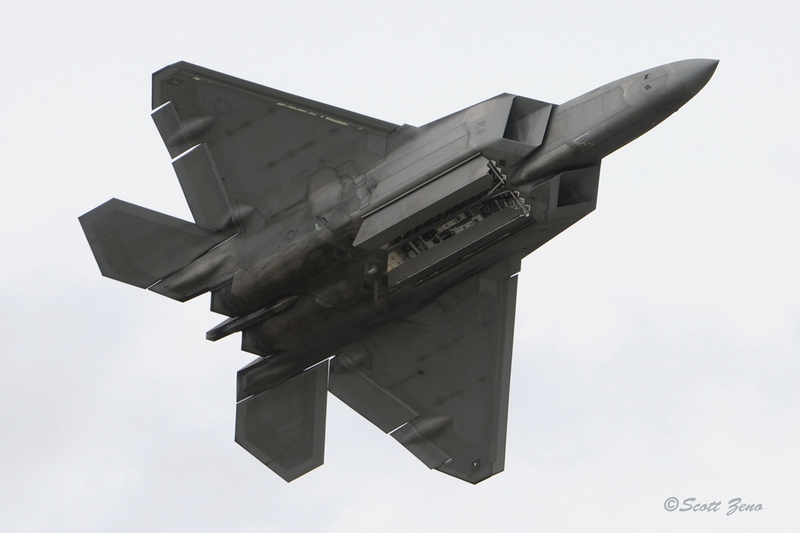 In fact, it was the first time ever, during the Saturday show, where I’ve seen three different headlining jet fighters could perform a hover… the Harrier and Lightning by way of their horizontal V/STOL capabilities, and the F-22 in the vertical axis leading up to its’ tail slide maneuver. 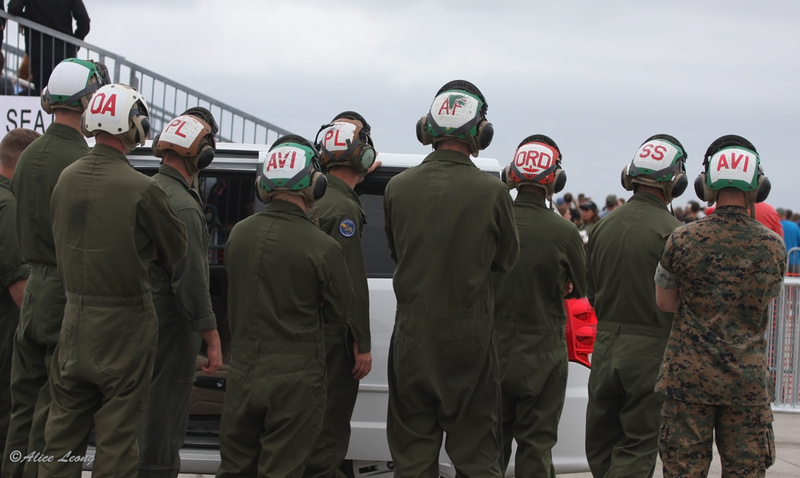 Before the Blue Angels took to the sky to provide the show’s grand finale, a local Marine Air Ground Task Force made a memorable attack on the air field. 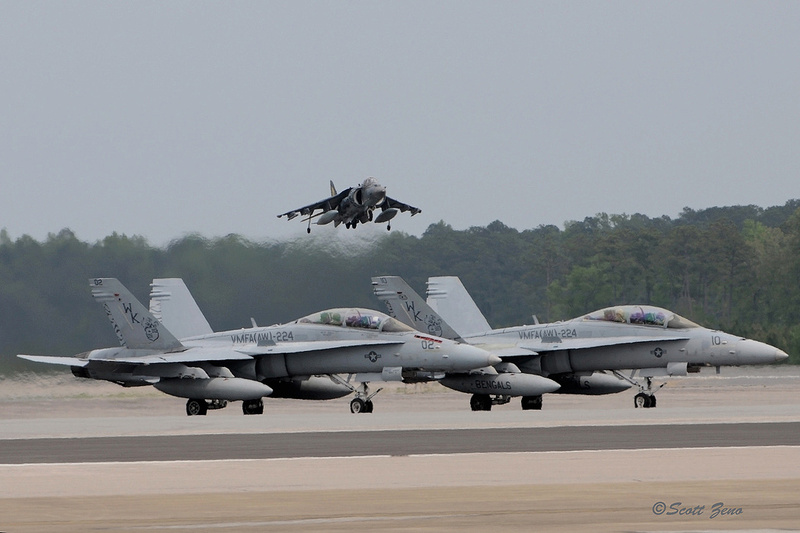 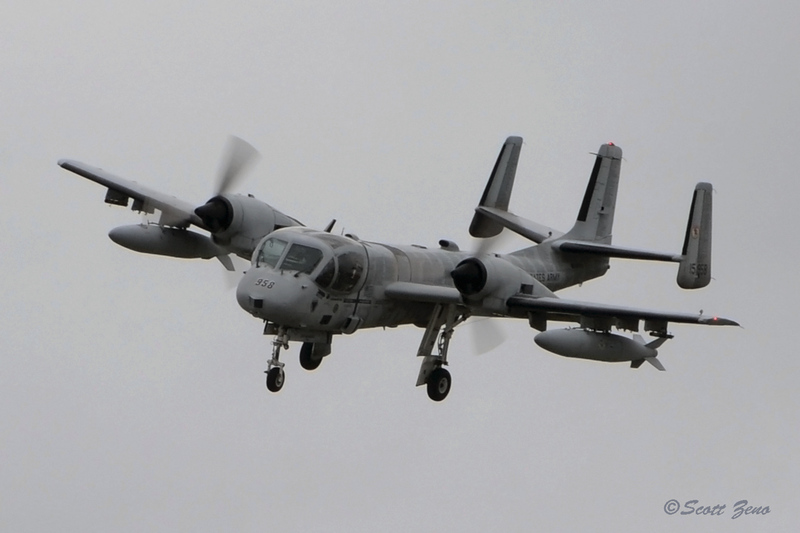 Weather grounded the fast jets on Saturday, but Sunday saw their inclusion on an airfield assault by two Ospreys – full of Marine infantry – supported by Cobra, Venom and Super Stallion helicopters and Hornets, Harriers and a Prowler. 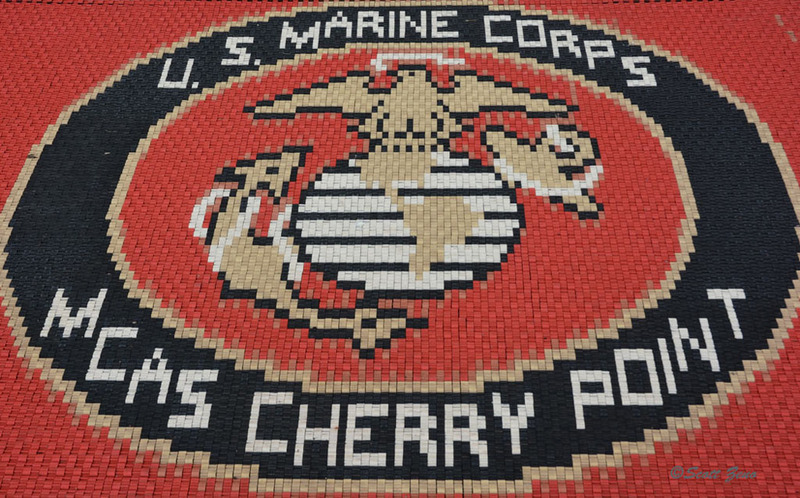 Complete with a pyro accompaniment and a grand finale “wall of fire”, the troops advanced in front of the crowd to lots of applause. 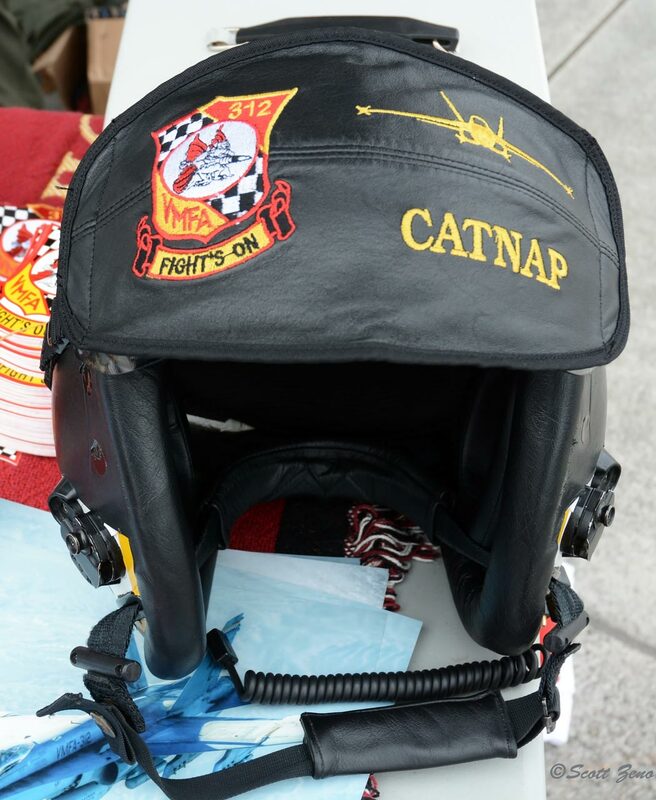 With lots of history to take in over the weekend, one could fill a book with the information that was on display. 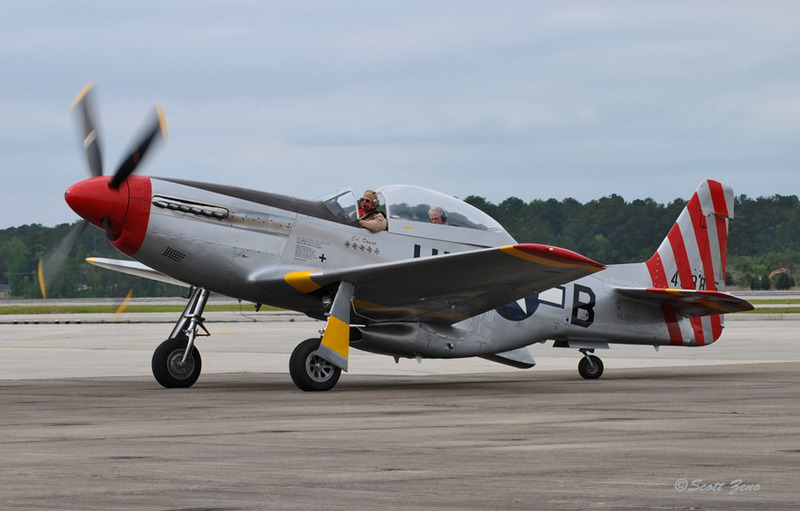 This benchmark of the base’s 75 years in service presented a brief look at some interesting aviation history made in eastern North Carolina, through the aircraft on display and the people who fly and maintain them. 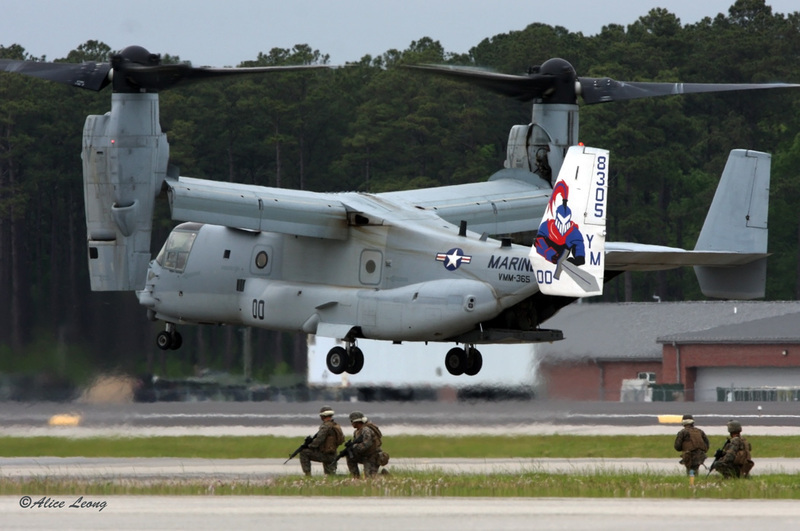 Without the assistance of the MCAS Cherry Point Public Affairs Office, much of the information and photos seen here couldn’t have been collected – thank you to all of the dedicated Marines we met during this past week!